I was inspired and needed to make a giraffe quilt. I found this image on Pixabay which is a copyright free resource for images. I printed it out as a full page and then had to decide how large to make the quilt. This time I wanted it big, and I mean really big. I always get that feeling when I see one of my quilts out in the wild, at a quilt show, that the quilt looked so much bigger at home. So instead of increasing the size by 3 times or 6 times I decided 10 times. I was now making my giraffe image about 90″ x 70″. My usual method of making my pattern is to draw a grid on newsprint. 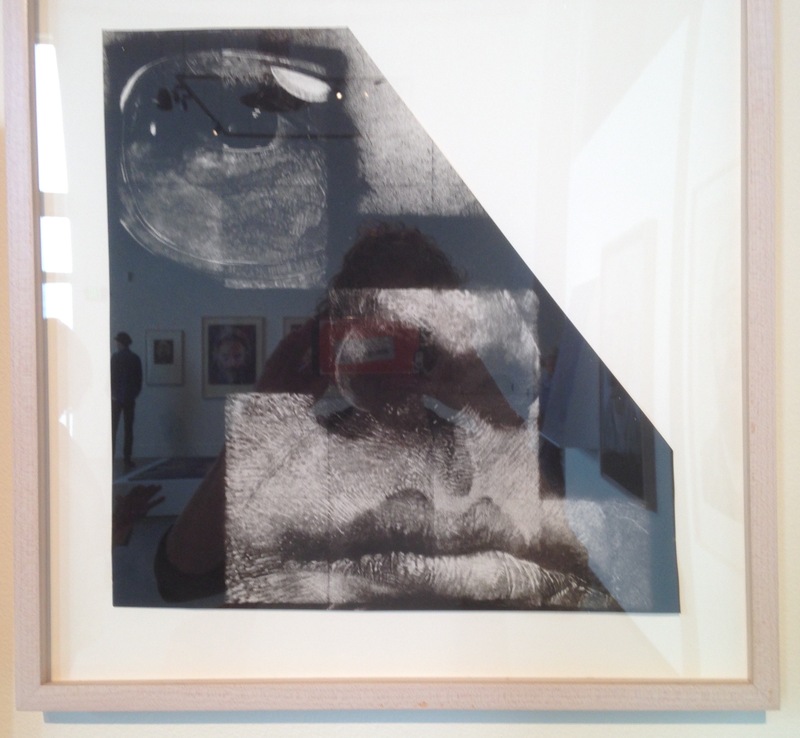 I drew 10″ squares and then transposed the lines from the 1″ grid that covered my photograph. I began work on the tongue and that was 12″ long. The fabrics I decided to use for the giraffe included many upholstery and furnishing fabrics, as well as linen, burlap and regular quilting fabrics I had in my stash. I was not thinking about the background at this stage. Working on a large scale was hard. On my usual worktable the collage would be falling off any chance it had and keeping all my fabrics close had its challenges too. I first completed the head as a single unit and then I tackled the neck, that would lay behind the head and then be glued in place. Completed head laid out onto batting. Once the giraffe was made I was very happy and had now to figure out the background. I cut a piece of batting to the approximate size of the completed quilt and using my family room floor laid it out with the giraffe in it place. I decided to go with green patterned fabrics that I been setting aside and these included hand-dyed and over-dyed, batiks, African fabrics and other pieces I again found in my stash. Using the floor space in my family room. To complete this quilt I made up my backing and taped it down to the floor. Lay the batting over the top, positioned the giraffe it its spot and then lay out my background fabrics. 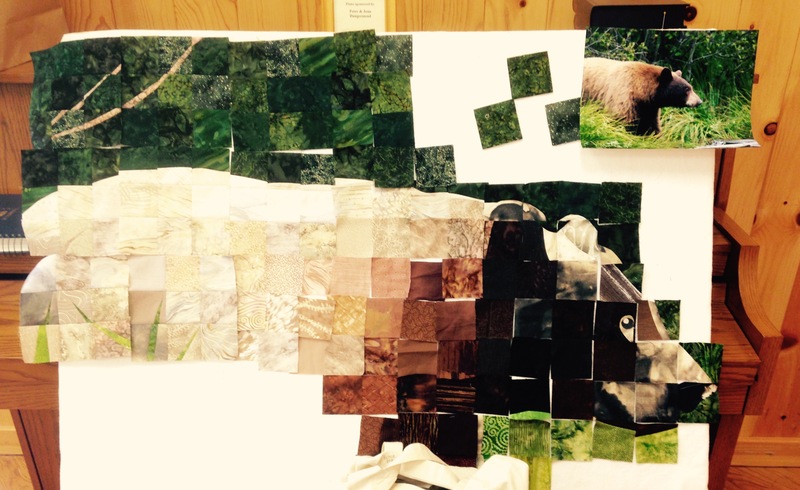 These I cut to size and pieced together as I went making sure they tucked behind the giraffe. Eventually all the batting was covered and I could glue the giraffe in place. I took my iron and pressed it all while it still lay on the floor, finishing with safety pins to hold the three layers together. To quilt all my quilts I use my regular sewing machine and this quilt was hard work I will admit. I think using the heavier upholstery fabrics and burlap made the quilt stiffer, harder to handle, fit under the machine and generally hard on my body. So I do remember working for only a hour or so at a time especially on those tricky parts in the center of the quilt. My husband decided the giraffe needed to be called Melman after the giraffe in the movie ‘Madagascar’. 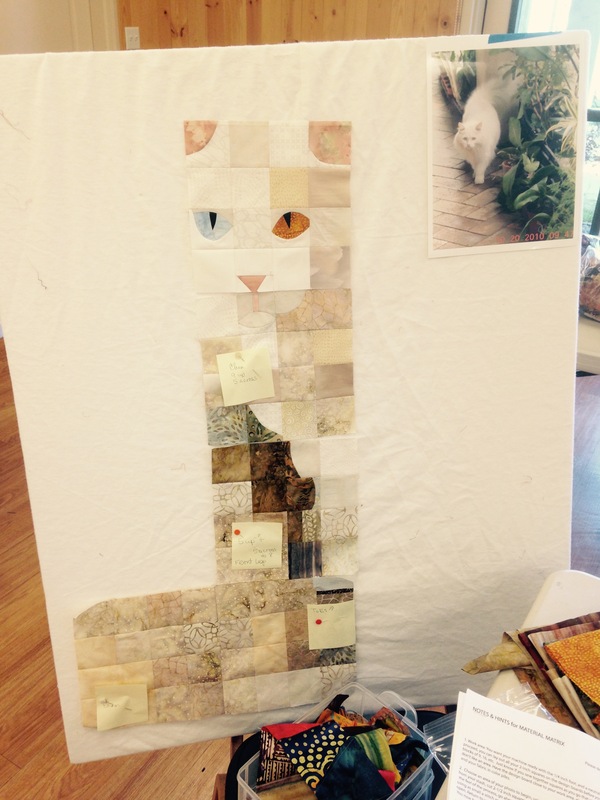 So the quilt is named ‘Melman, The vulnerable Giraffe’. I decided if I sold the quilt I would donate half the money to the Giraffe Conservation Foundation. 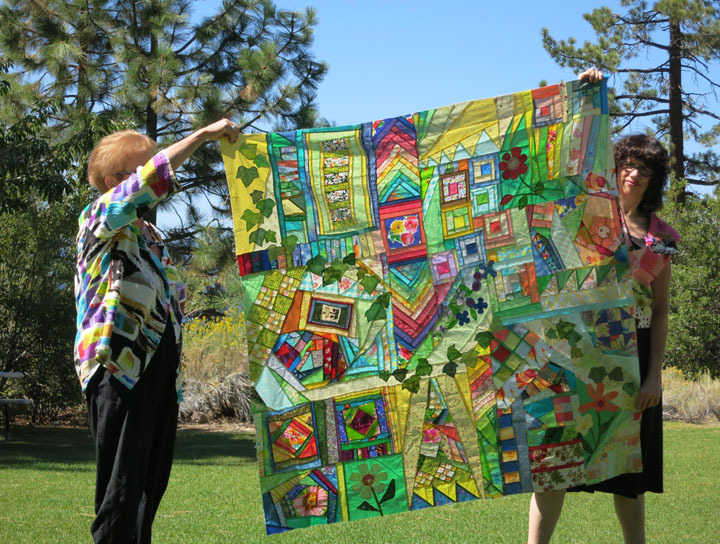 It was juried into IQF Houston in 2017 but didn’t sell and this summer it will be at Sisters, Oregon for their outdoor quilt show on July 14 2018. So he’s still for sale! 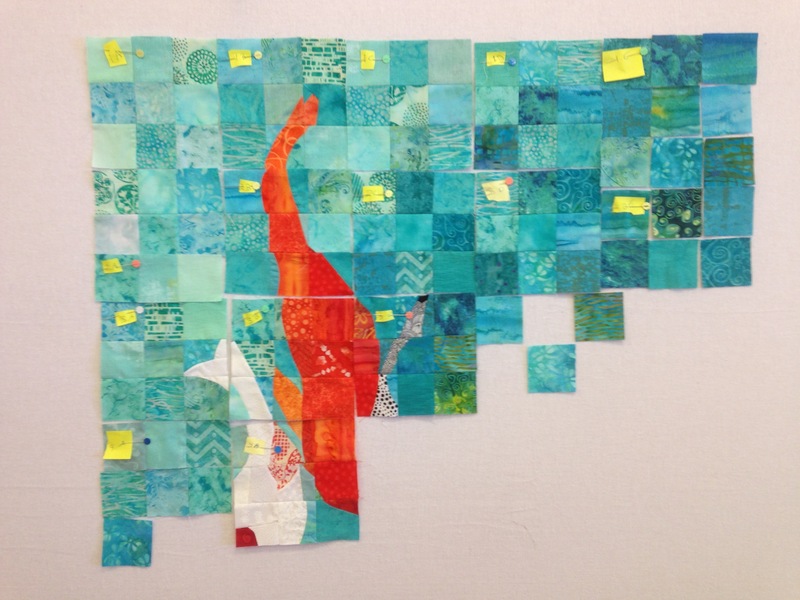 Having explained my process of making a fabric collage art quilt I must say making a smaller quilt is easier, fun, less daunting, and easier on the body. 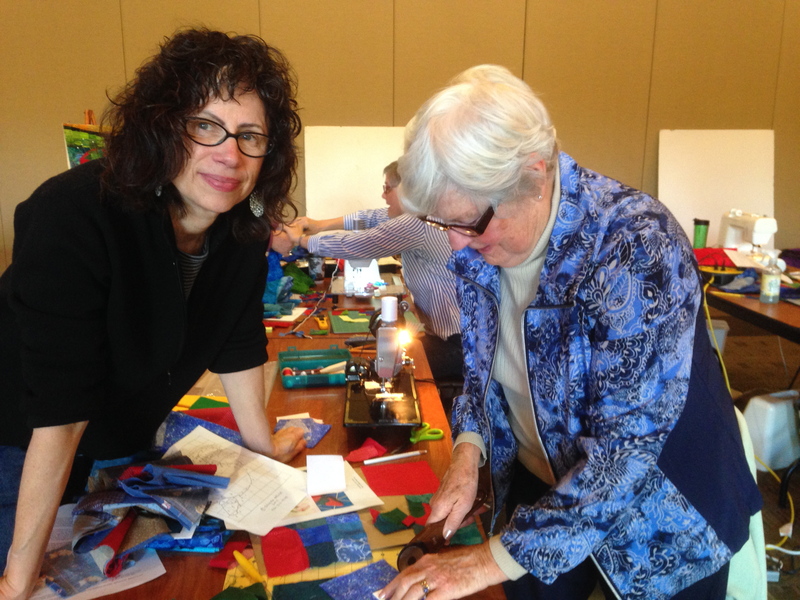 So join me at my workshop Fabric Collage Addiction, if you can, September 3-7 2018 at Zephyr Point for the Artistic Alchemy Retreat. Artistic Alchemy will be “out in the wild” this coming weekend, May 5 & 6 at the Pine Tree Quilt Show at the Nevada County Fairgrounds in Grass Valley. So come down and meet us, chat about the retreat, hear about our show special and see what ‘goodies’ we have for sale. Here are a few of the things I have been working on for that sale. 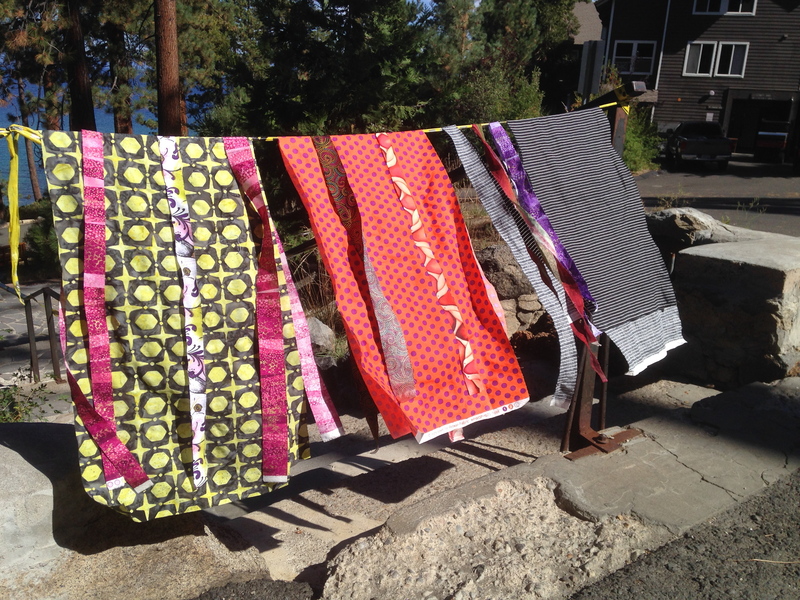 Lake Tahoe is beautiful in September so combine a trip to the mountains with sewing and play time. Check out the 4 workshops on offer from Mary, Heidi, Sandra and myself, or just work on your own projects. 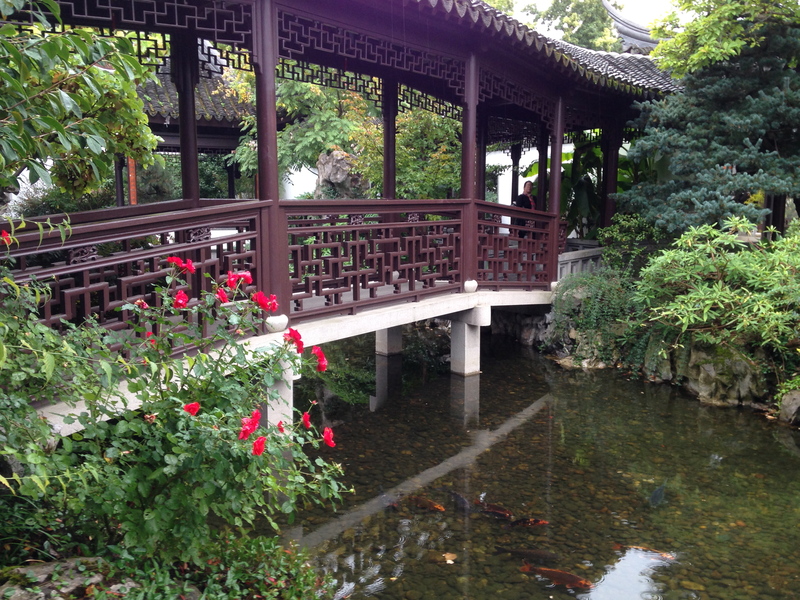 What could be better than taking a break from the heat and surrounding yourself with creativity. 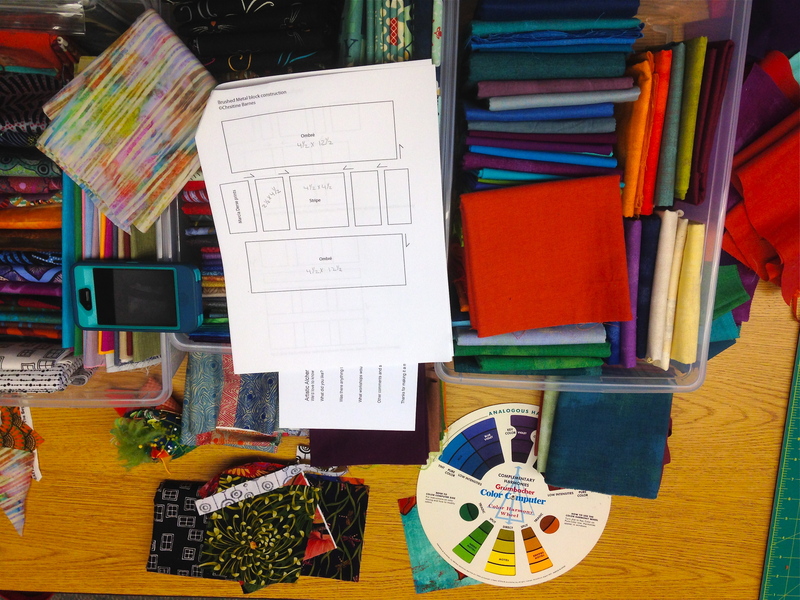 All my students signed up thus far for the Zephyr workshop have sent me their photos to grid and I’m sure they are happily selecting fabrics to use. I do have a couple of spaces left, anyone who is a procrastinator and contemplating coming to Zephyr in September! We 4 welcome latecomers. 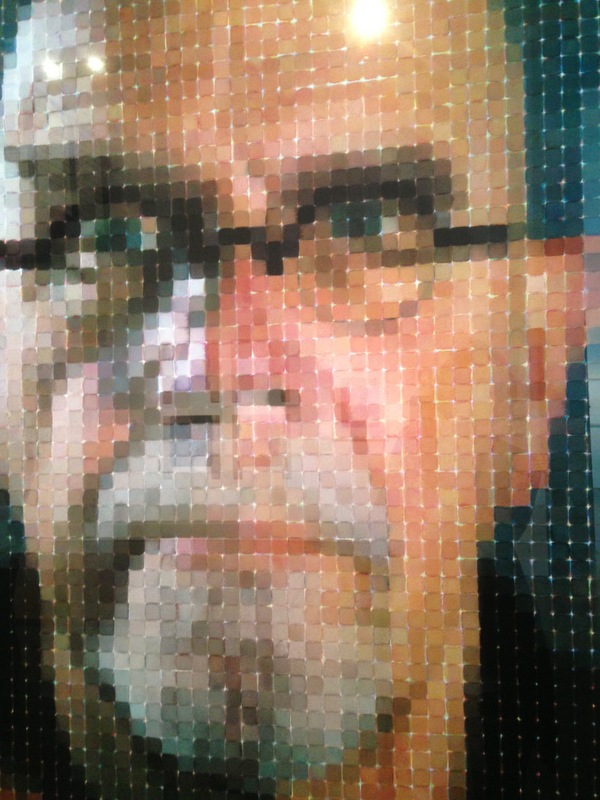 I wrote a blog post months ago about Chuck Close: his influence upon my Matrix technique and the 2 quilts I made of his image taken from a photograph by the photographer Gianfranco Gorgoni. 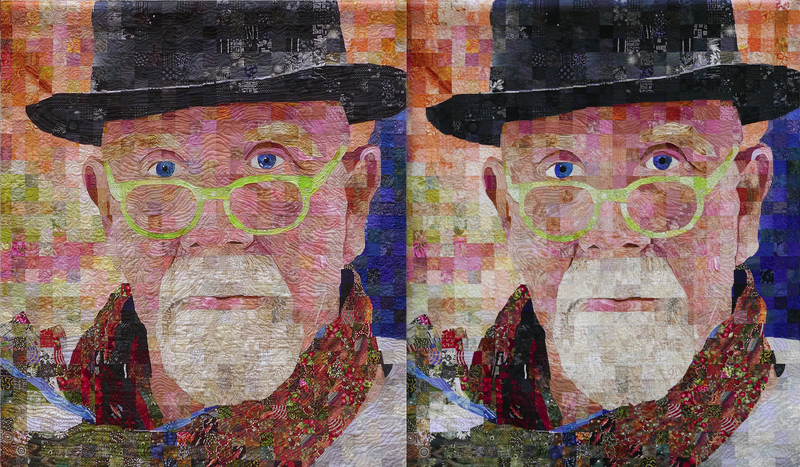 The story of these quilts, “Chuck Close One” and “Chuck Close Two” (both 60″ by 70″) is a fragmented and ultimately puzzling one which I have not written much about, in part to protect the information I received about Chuck and his health. 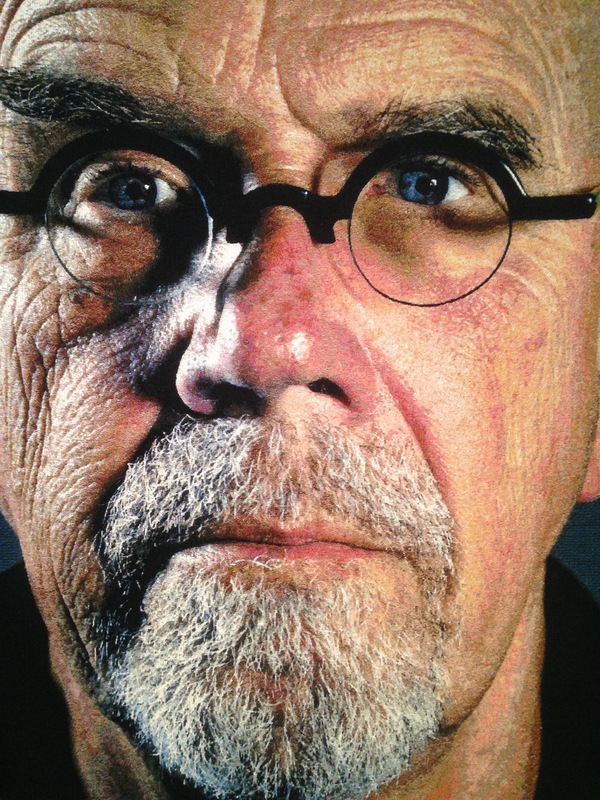 Suffice it to say, “Chuck Close One” is in the hands of Chuck Close himself, and “Chuck Close Two” I recently sent to Houston for the show in November. I entered it in the “Hands All Around” exhibit, which will travel internationally for a year and be seen by many people. 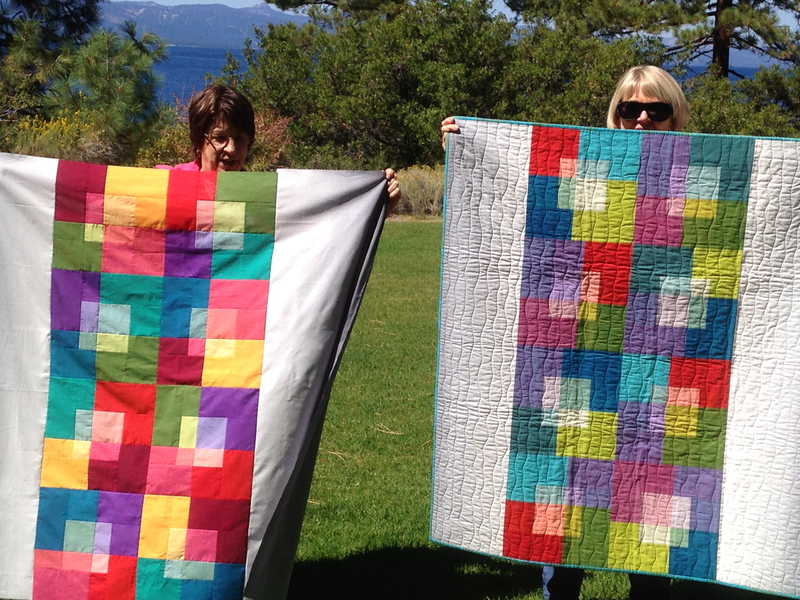 The tops of these 2 quilts were made at the same time and look very much alike. I am thankful to Gorgoni for being the go-between to help me get the quilt to Chuck. I am glad he has it. Here they are side by side. During the first week of July I took a road trip with my son Matteo. His bike went in the back seat of my car. His emphasis was riding skate parks on his BMX, and I enjoyed being with him and occasionally hitting a fabric store or two, and visiting friends along the way. I knew there was an exhibit in Everett, WA of Chuck’s work and I wanted to be sure to catch it. Chuck grew up in Everett, and attended the junior college there before going onto University of Washington and eventually Yale. My friend Kathy, Matteo and I drove up to Everett to see the show at the Schack Art Center. The emphasis on the show was about his collaborations with other artists, and there were examples of the many techniques Chuck has used. I will say here that I apologize for the quality of these photos, taken with my aging cell phone. But you get the idea. I like this first picture, badly taken as it is, as you can see my reflection taking the photo and also Matteo’s silhouette on the other side of the room. It’s a piece of a lithograph, one process that Close has done repeatedly. Here’s another lithograph, an older one as you can see by how young Chuck looks. Each square has little hatch lines drawn in diagonally to create the “values”. This one I had not seen before. 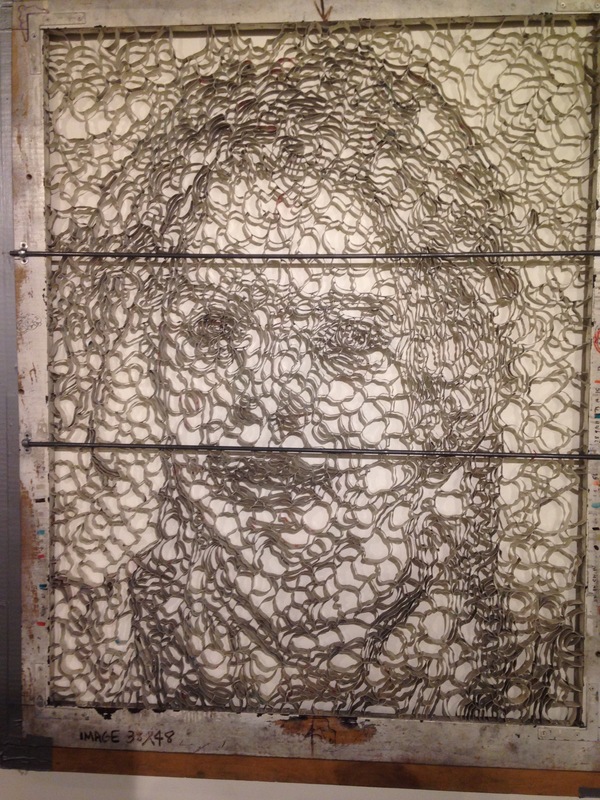 It’s a portrait of his daughter done in many values of paper pulp “blobs”, that were made from a form that he had someone make for him. The form looked like a giant cookie cutter, and took the artist over 2 months to make. Here is the portrait and the form for the pulp. There were a few pieces like this. The squares are filled with color, and the corners are left so you can see the paper beneath. I wish I had taken more care to read the information on this one so I could share it with you. I had seen this before in another gallery. 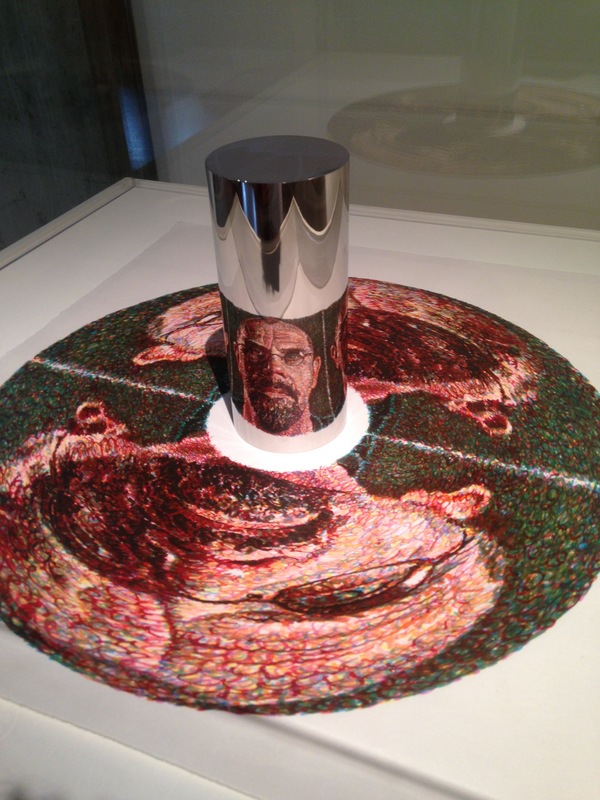 He painted his face, which you see at the base…..viewing it in the silver cylinder allows you to view it as he intended. I seem to recall from Art history classes years ago that there were artists during the Renaissance doing this technique. Amazing, isn’t it? 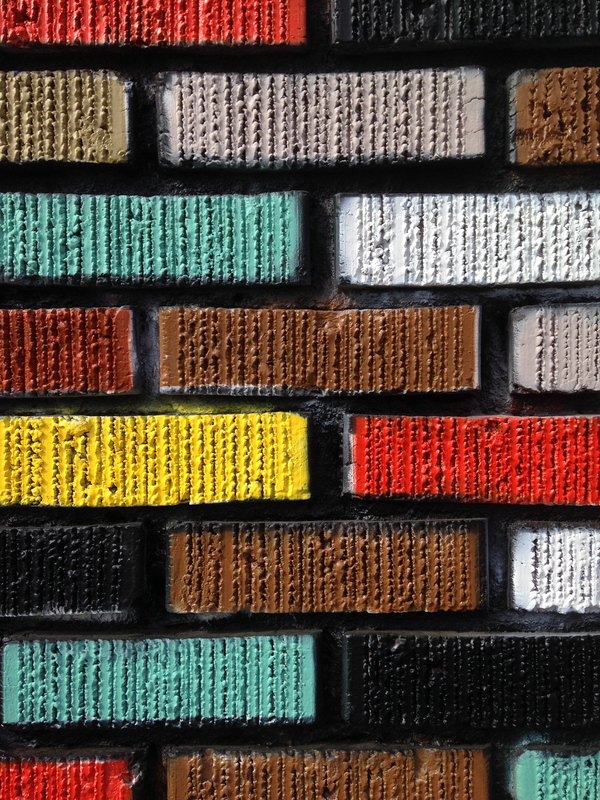 And yet another way of applying the paint in a grid. These round shapes were created by applying a felt circle to a stick and applying the paint with the felt. You can really see the texture and it’s easy to imagine him plopping those little circles on. 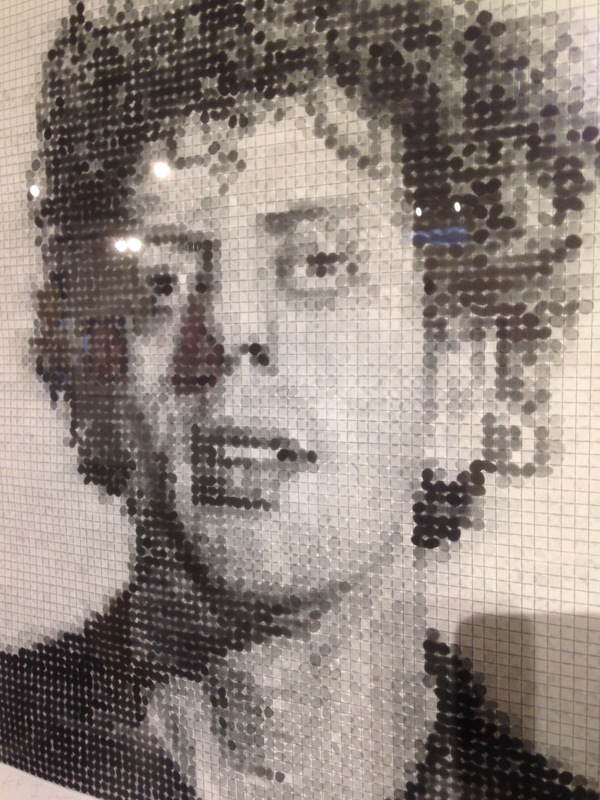 Phillip Glass, the musician, has been Chuck’s most repeated subject. Chuck really likes his features. 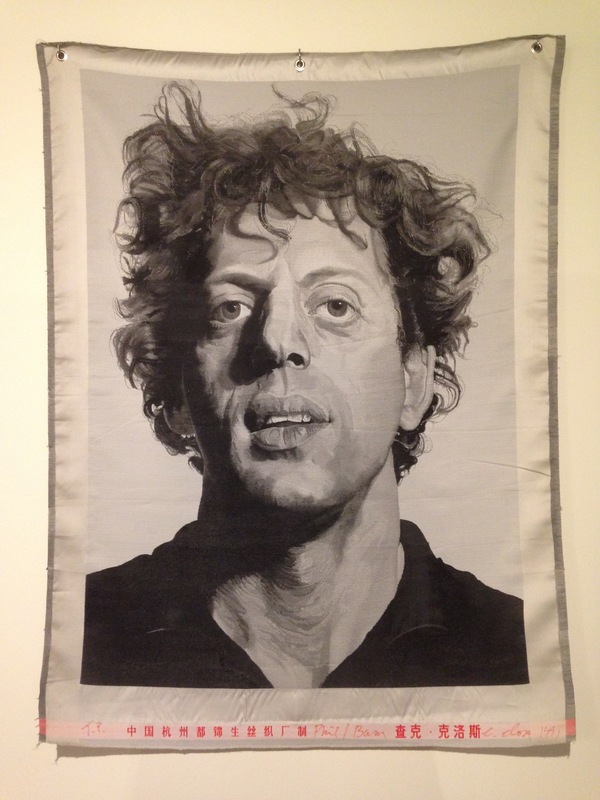 It was interesting to see the same image both in tapestry form, and as a painting that Chuck created using his thumbprint to fill each square with a value of grey. Wonderful! 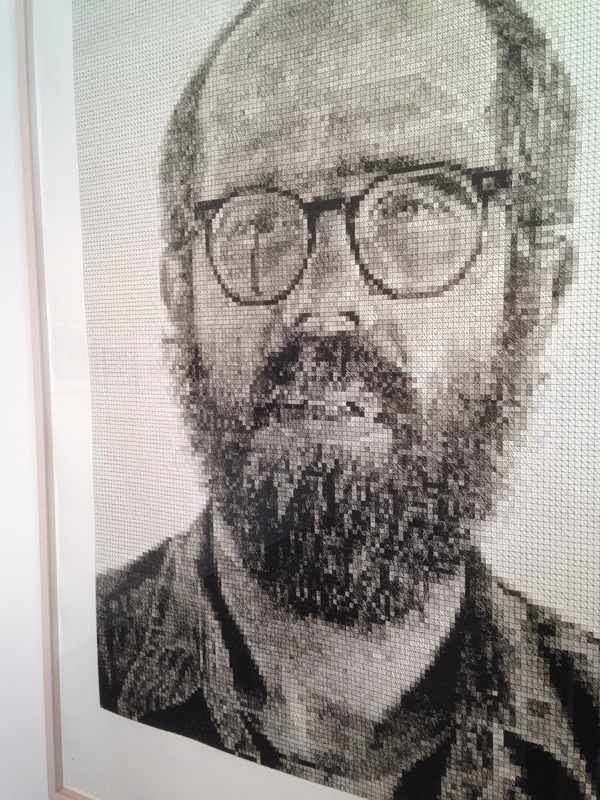 One more tapestry, reproduced from one of his self-portrait photographs. 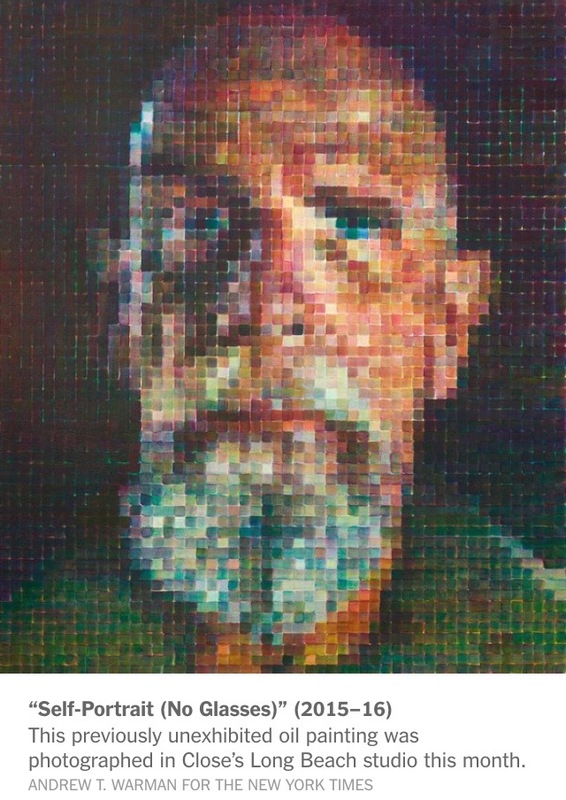 Wednesday, while stuck in a horrible traffic situation on my way to Meet the Teachers in Pleasant Hill (Heidi, Christine and I were presenters and we made it, finally), I was checking emails on my phone and noticed that several friends had sent me a link to an article about Chuck Close written by Will S Hylton in the NYTimes. Having literally hours to wait going nowhere, to pass the time I read the article out loud to Heidi and Christine. This article (link below), is a beautifully written and tender while at the same time probing piece about Chuck and his work in the latter part of his life. In reading it things came to light about where Chuck has been, literally and figuratively, during the last year or so while I was working on the quilts and trying to get the one to him. I hope you will read the article, which, while quite long, is so worth the time. 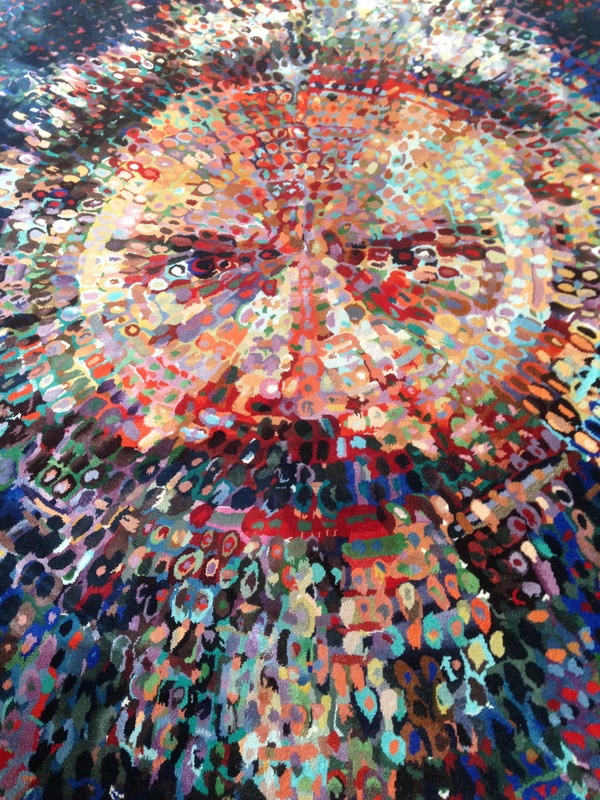 Chuck, such an enigma, is fascinated by faces, which he paints and calls “heads”. I am fascinated by them too. 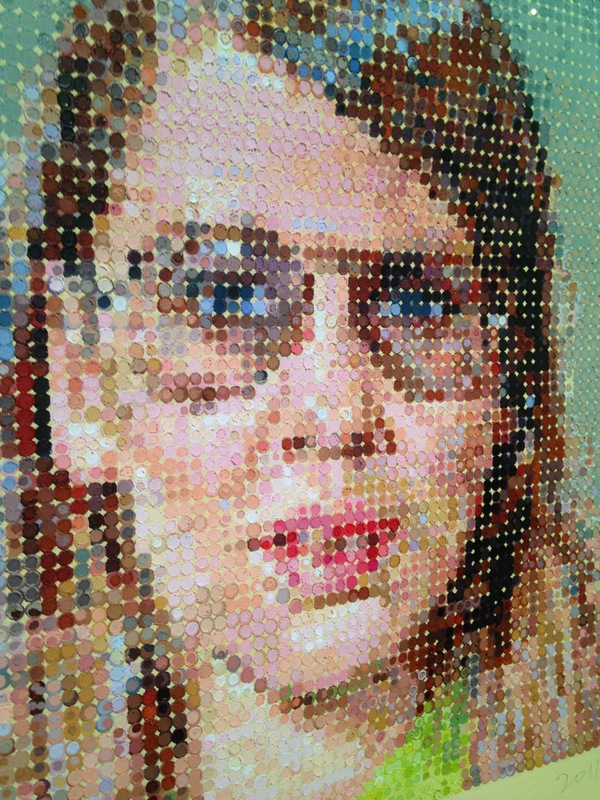 And I am fascinated by Chuck Close. 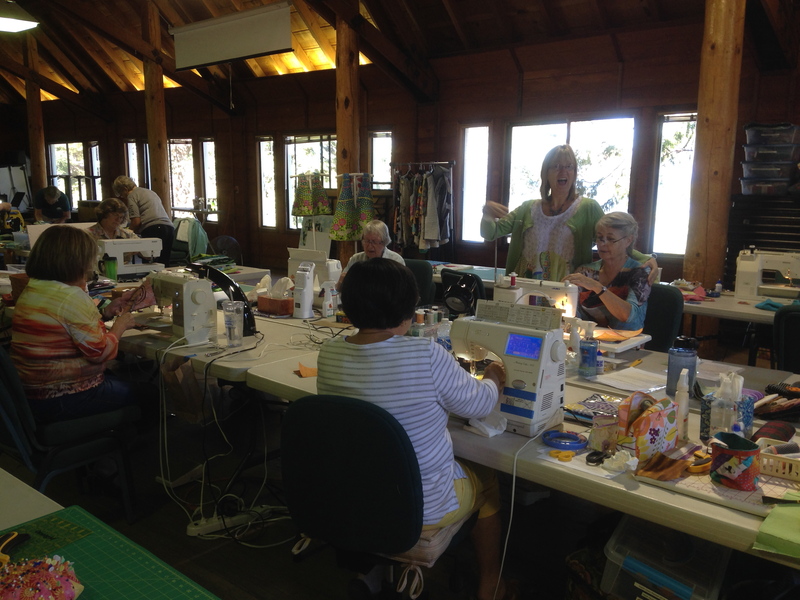 Christine and Heidi have written posts about our wonderful 2015 Artistic Alchemy Retreat from last month, my turn to share photos! 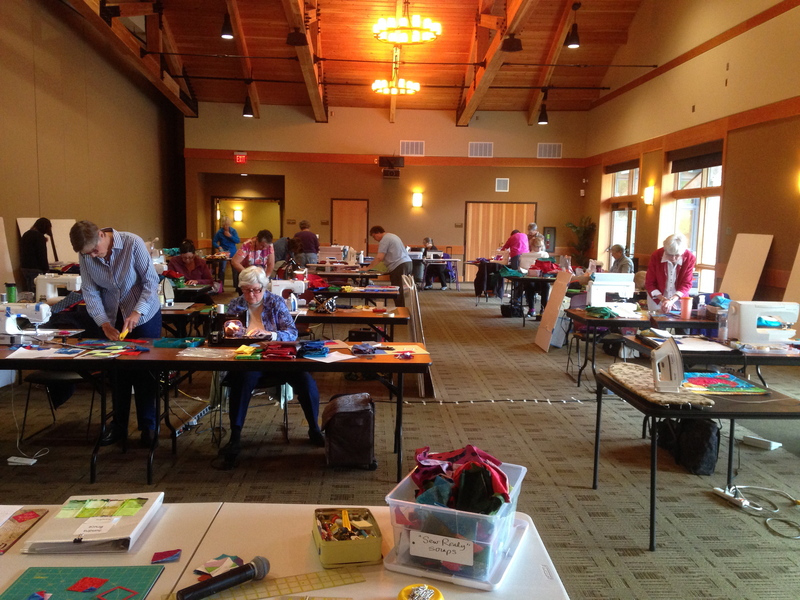 I had a 2-day break after the retreat, and after unpacking and packing again I headed up to Snohomish, WA to visit the Busy Bees Quilt Guild to do my presentation and workshop. I have friends along the way so decided to make a road trip out of it, visiting friends and hitting quilt shops, of course. 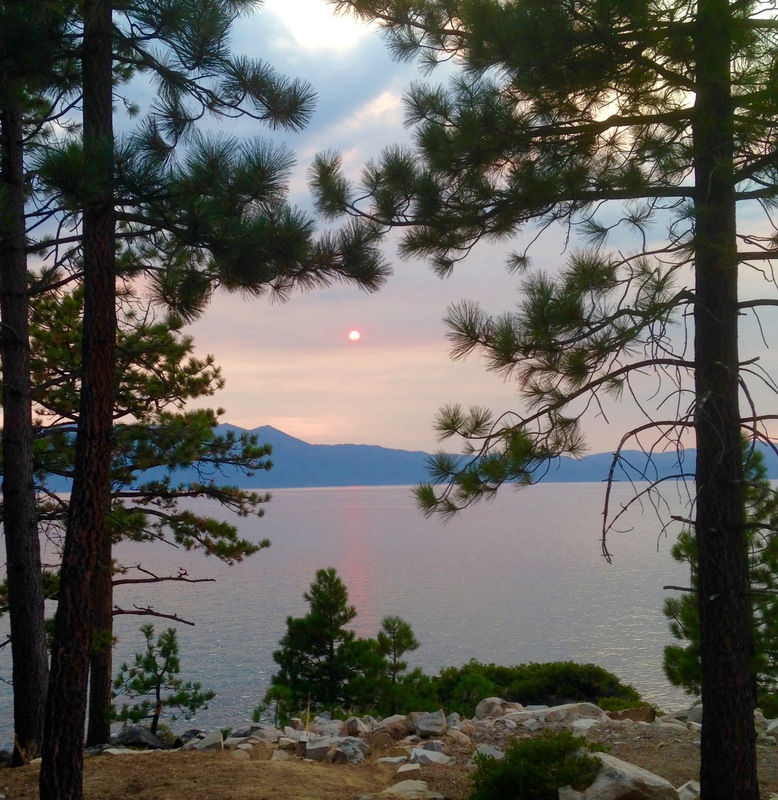 Here are some of my favorite pictures….first from the Zephyr Retreat, then from my trip north. At the very end is a surprise photo! I hope these pictures will inspire you to join us next year! We already have several signups and can’t wait to start planning the 2016 retreat. 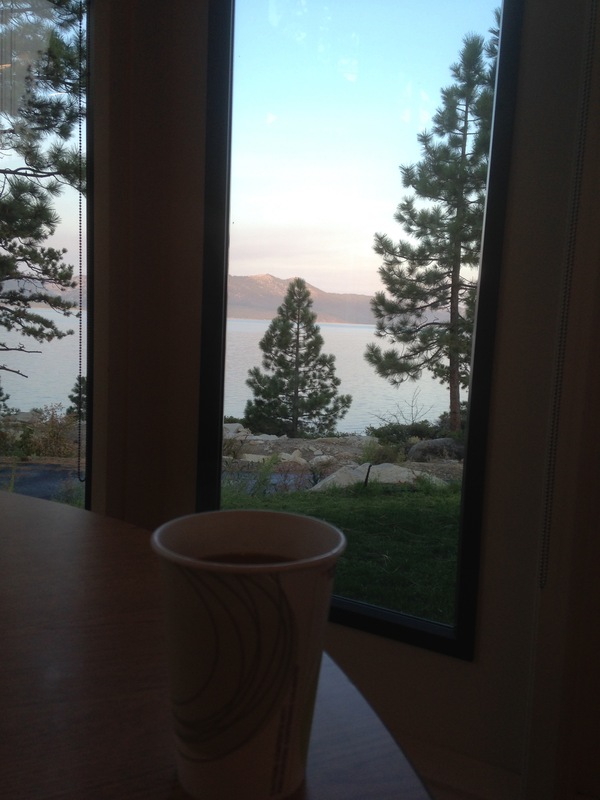 Waking up with coffee and this view of Lake Tahoe is a great way to start any day! 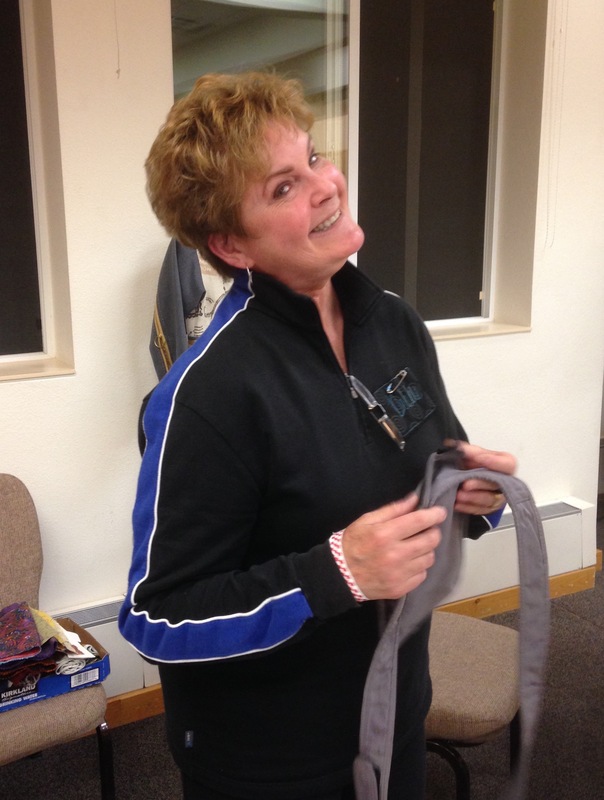 Our assistant, Debbie, helped make things run smoothly. 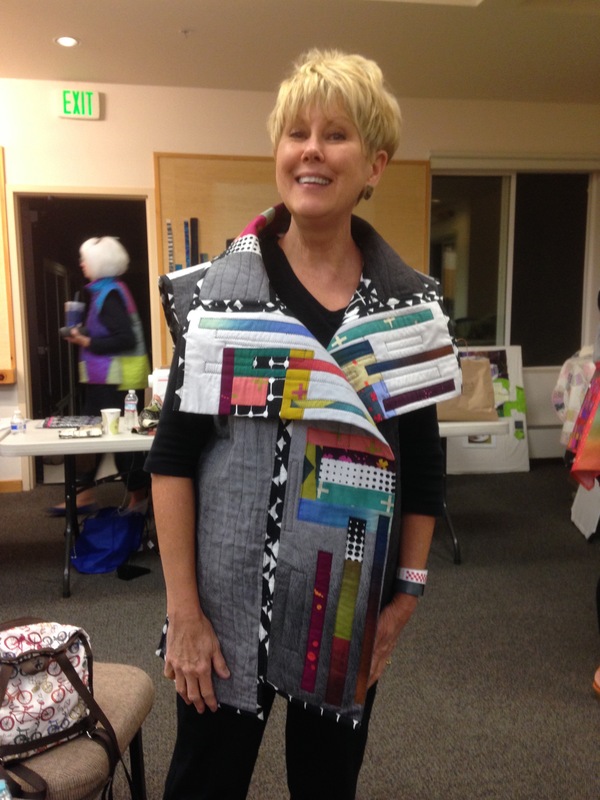 Here’s Mary Boalt, our Artist-In-Residence, in Heidi’s class project, the “Off the Grid Vest”. So cute!!! 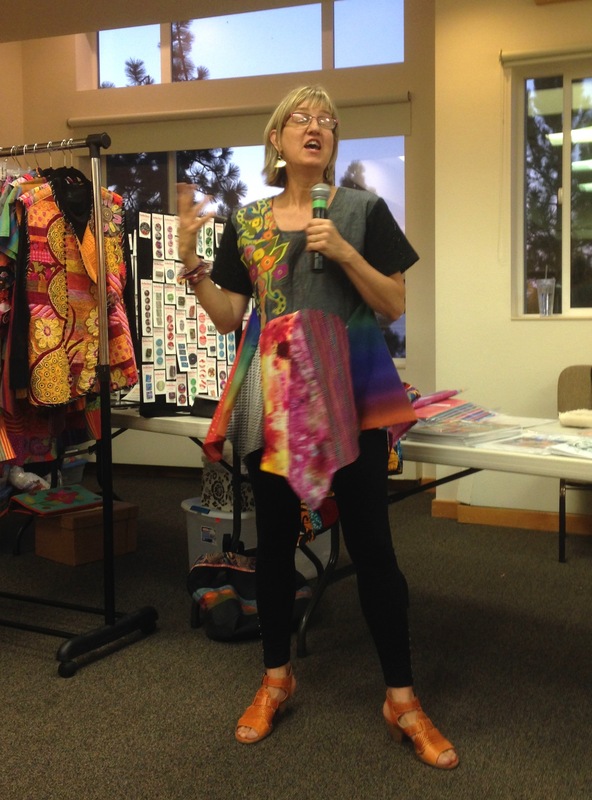 Heidi, in her Whisper Blouse, giving her trunk show! 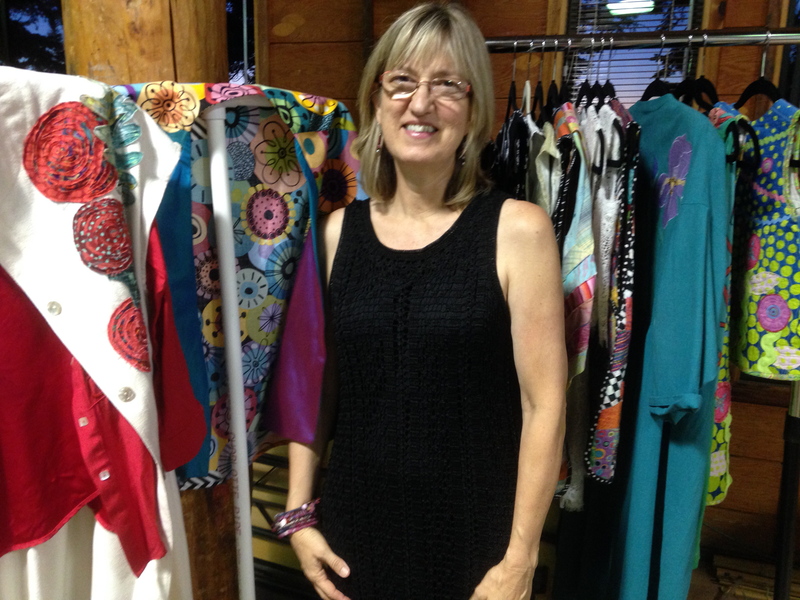 Christine’s trunk show, including quilts and vests! 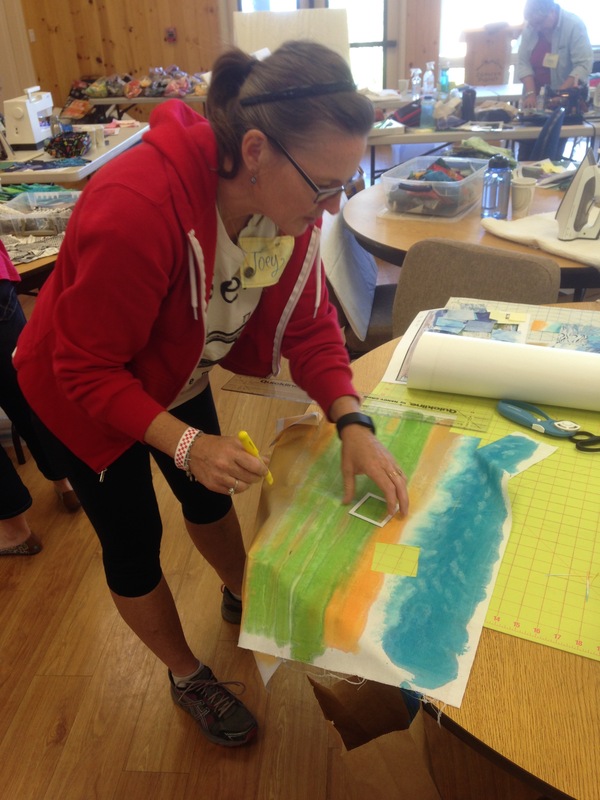 Jennifer, all the way from Ontario, Canada, working on her Matrix piece in my class, from a picture of her dog, Soda. I had 10 students and I enjoyed them all! 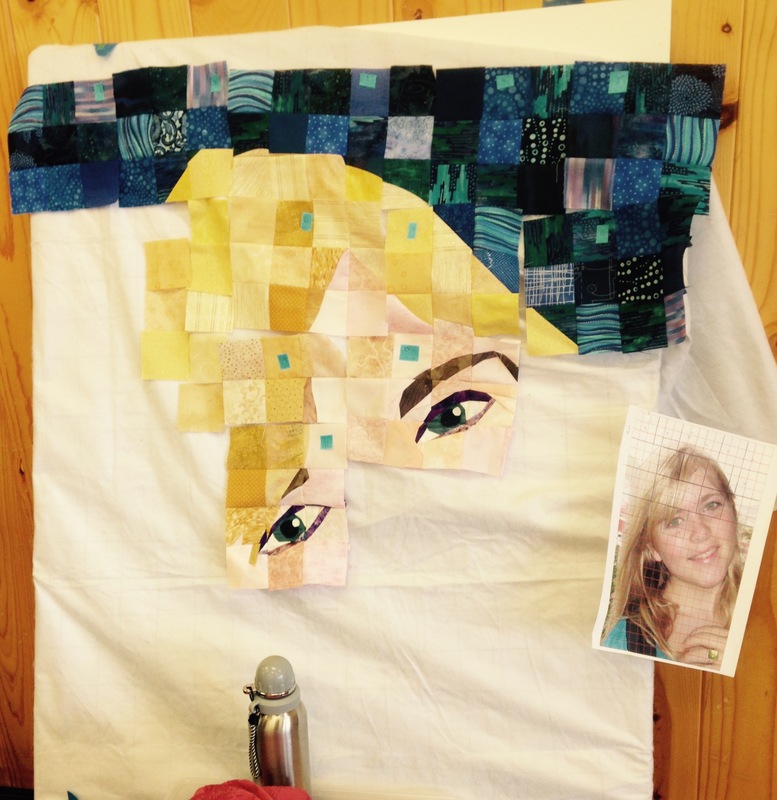 Such a diversity of quilt subjects! 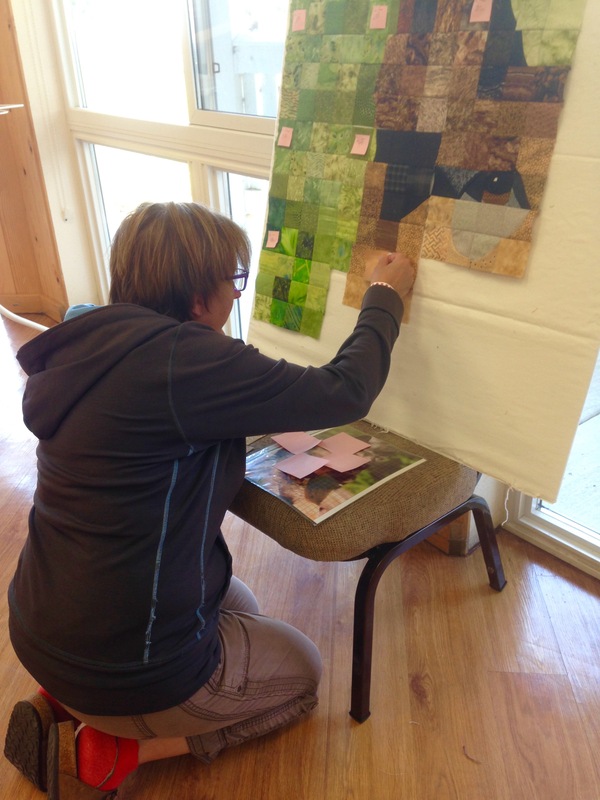 Joey working on her Matrix quilt, an industrious undertaking of the “world”, from a map. 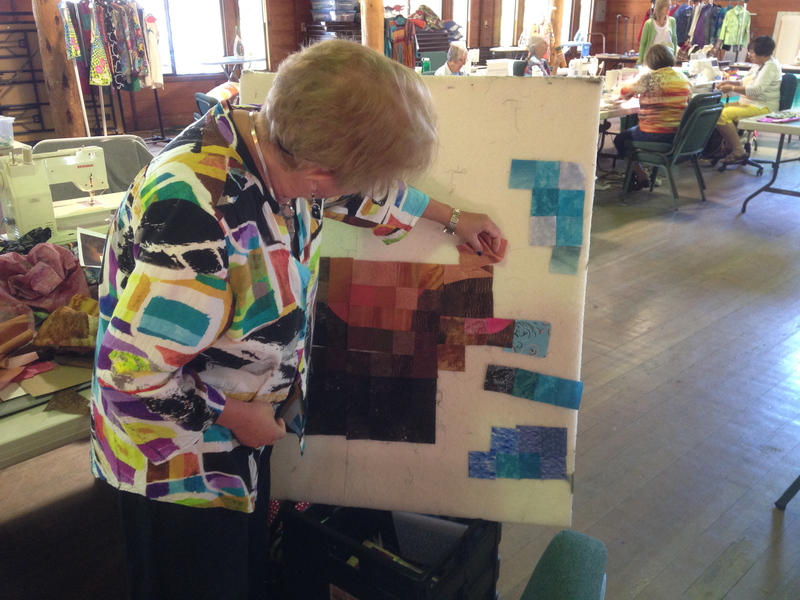 Ellen, with a beautiful image of a succulent plant, working across the width of her piece. 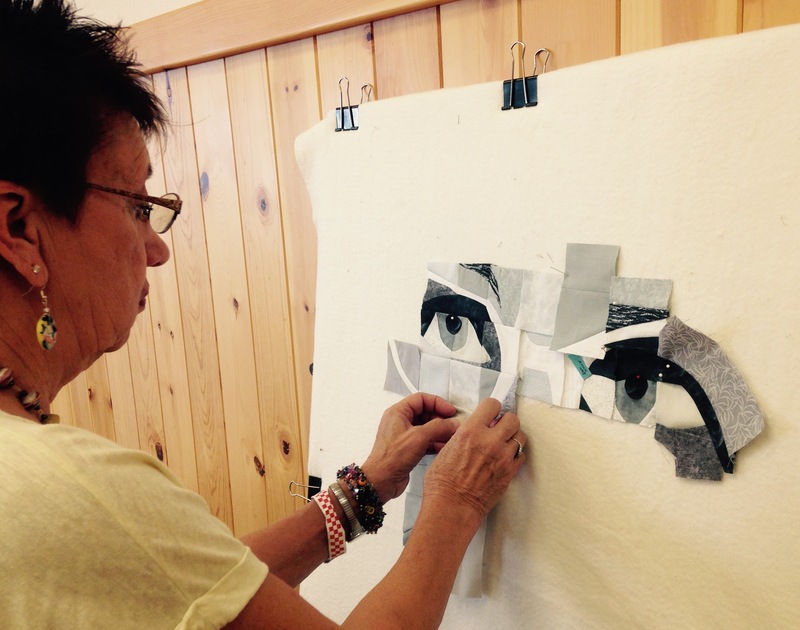 Jan tackled the hardest parts of her image first, the eyes, in black and white. 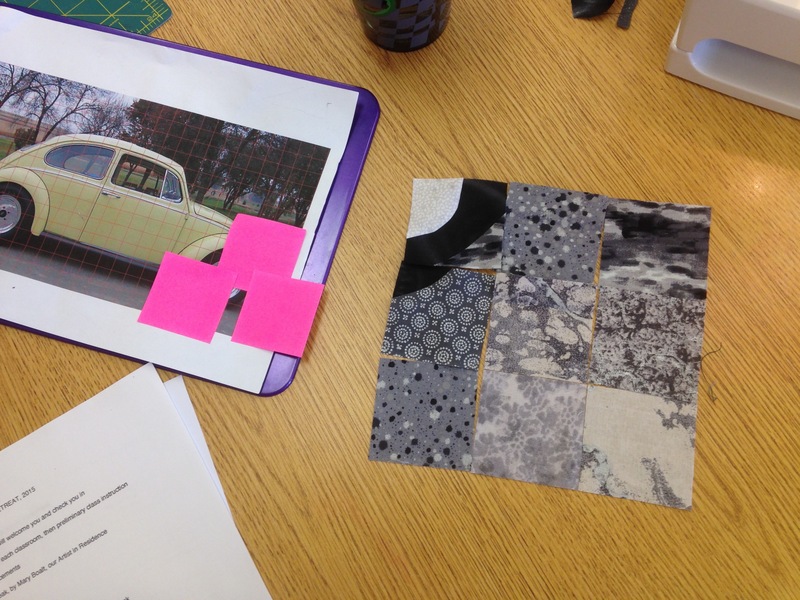 Debi worked on an image from her past, a Volkswagen Bug. 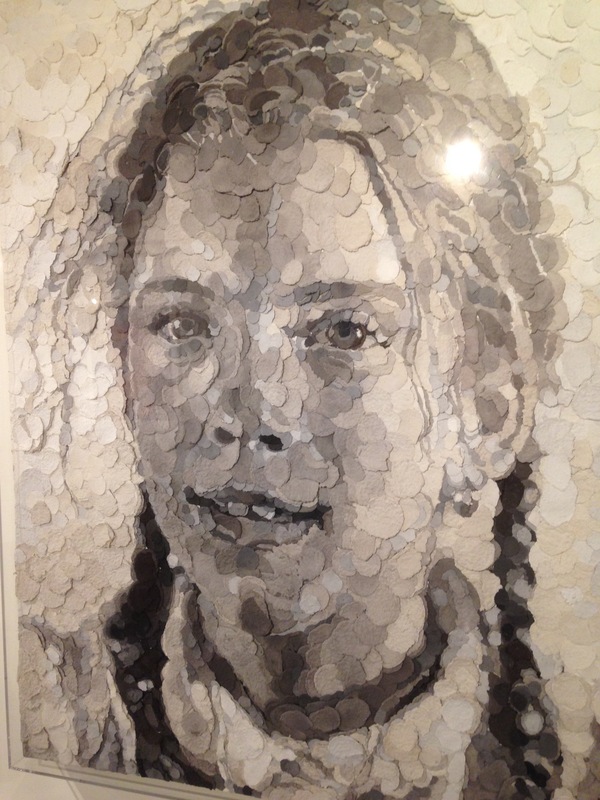 Gina also did a face for her Matrix project, her daughter. 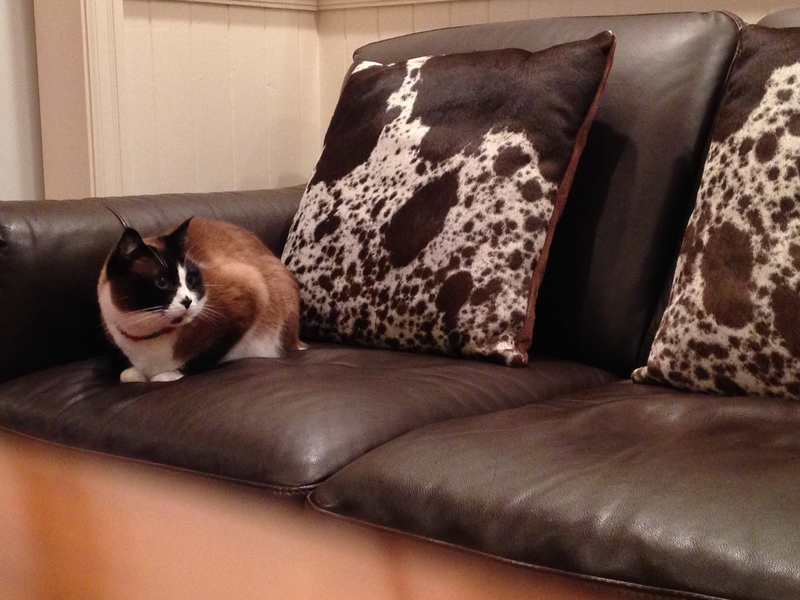 Caryn’s kitty cat has 2 different colored eyes! Fun to piece! Rosemary’s bear…he came to life before our eyes! 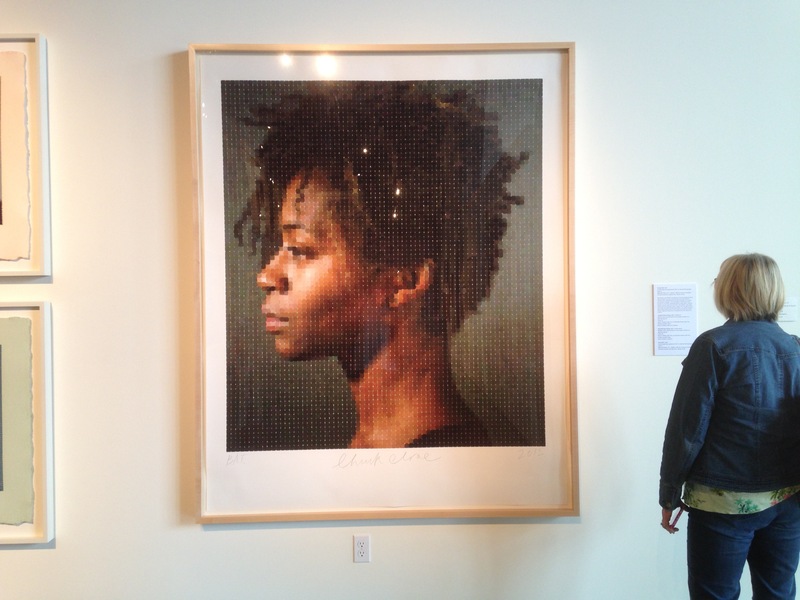 During my evening presentation Trish showed her Matrix Self-portrait, inspired by mine. 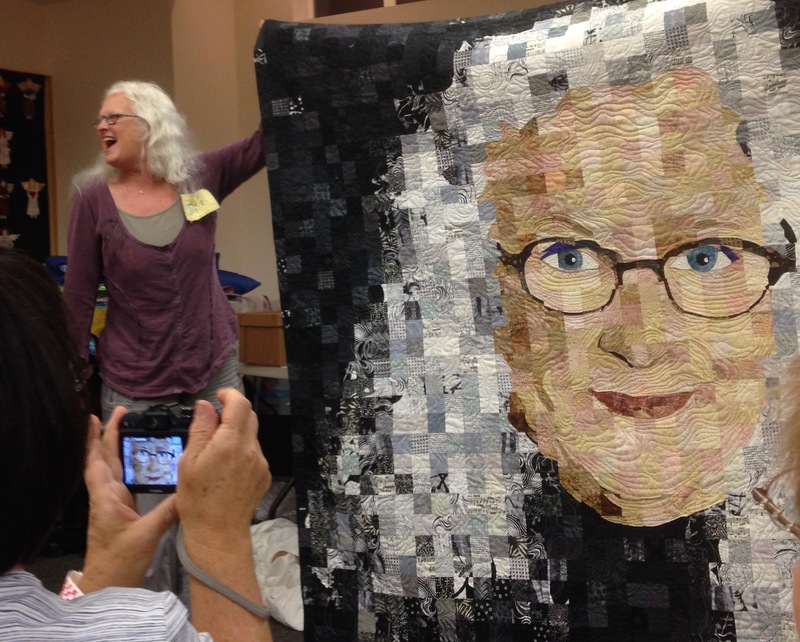 This is a fun picture of her, and the quilt. A big thanks to everyone who came and helped make the 2015 retreat such a success! THANK YOU! 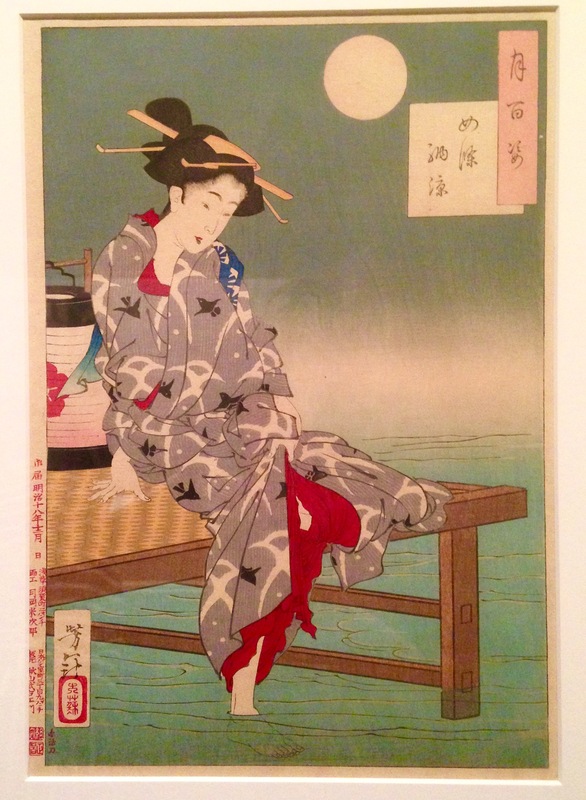 A very quick stop at the Portland Art Museum…my favorite from all the exhibits was a collection of woodblock prints by Tsukioka Yoshitoshi from 1887. I loved them. Breakfast in Portland, at the Milk Glass Market. 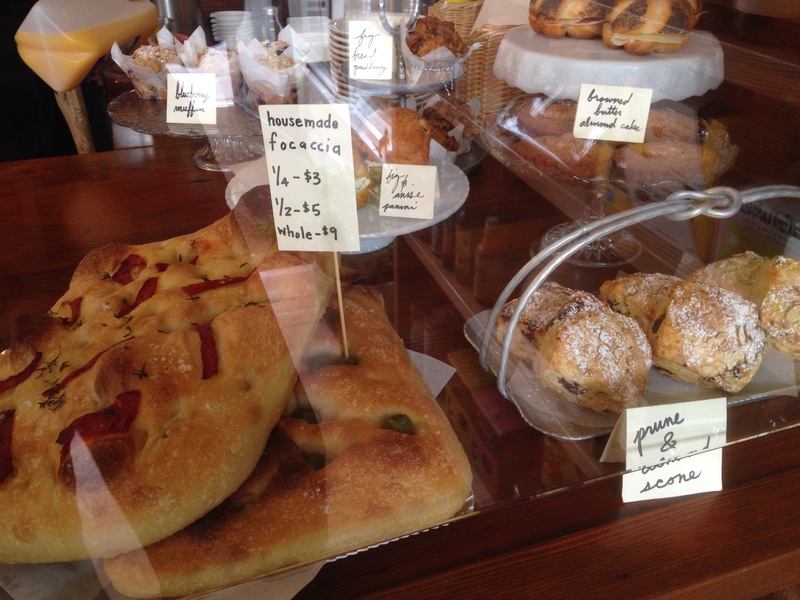 Look at this array of bread…. Snohomish is a very sweet little town, northeast of Seattle. 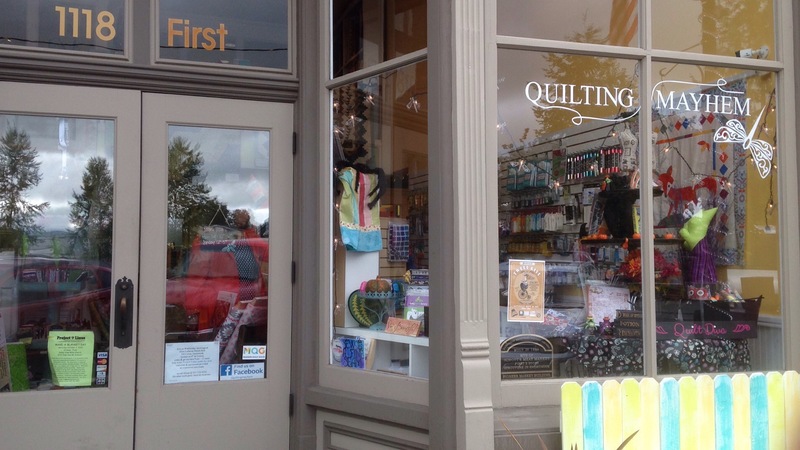 This quilt shop was a must see! Darlene, my very gracious hostess there, took my workshop and made sure everything went smoothly. She took very good care of me, and I very much enjoyed being with her book group one evening! 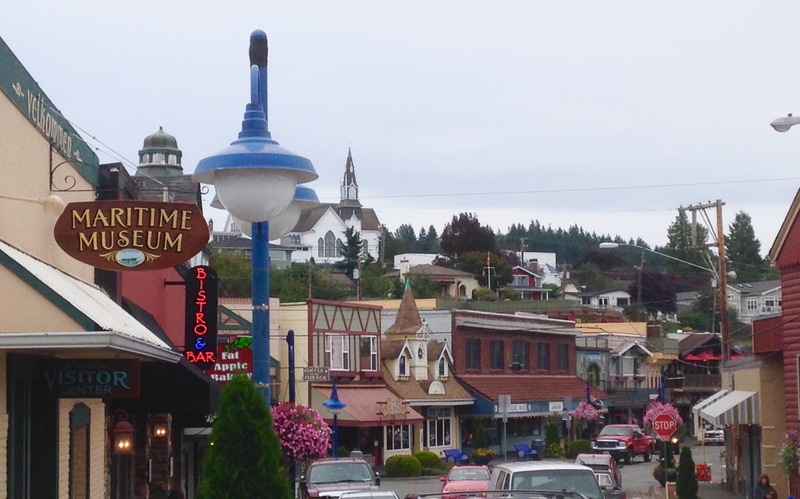 Darlene and I took the ferry over to this charming town, Poulsbo, which boasted 2 quilt shops. At the end of my visit in Washington I visited another friend near Seattle, and we dined one special night in this restaurant in downtown Seattle, “Purple”. 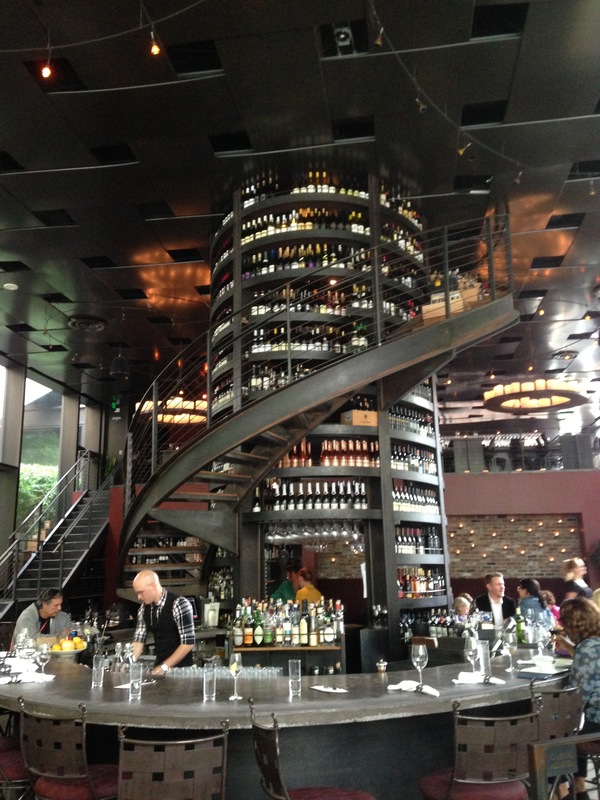 Check out the tower of wine being displayed! Nearby is Puyallup, WA, (which I can never pronounce correctly!) 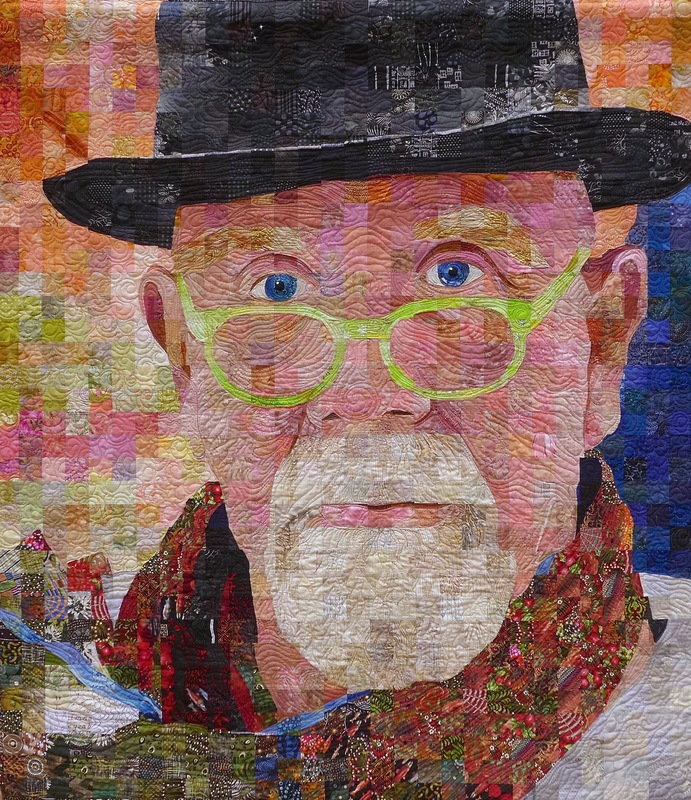 where this amazing quilt shop is. Thousands of bolts of batiks! Unbelievable! 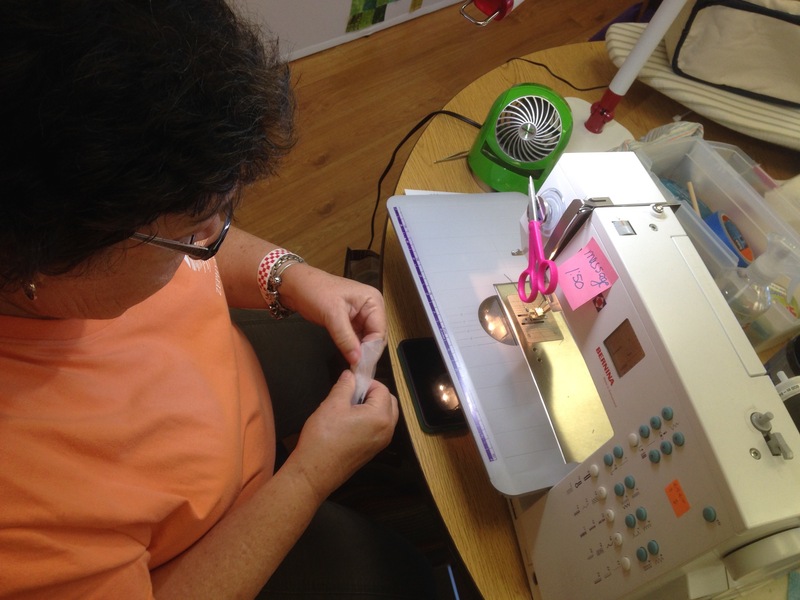 I have many customer quilts in the queue to do, better get busy! Happy Fall! 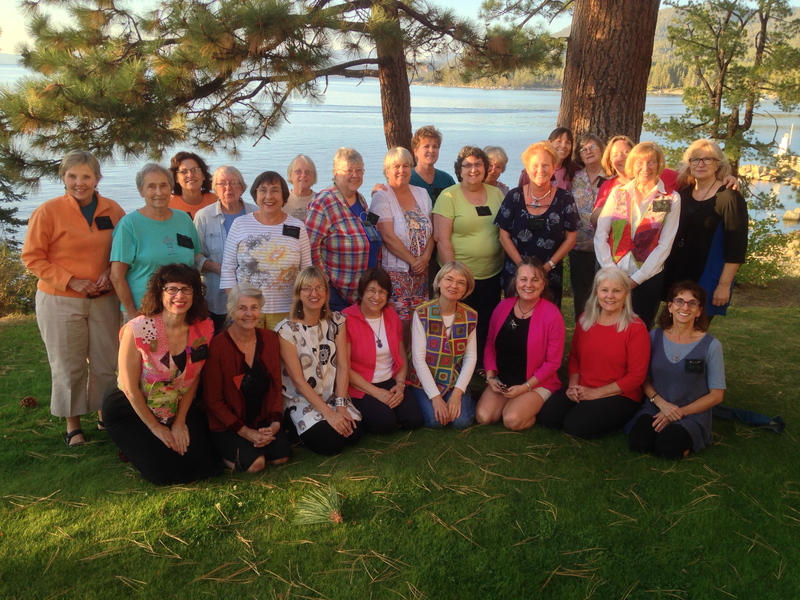 I had a fabulous 12-day trek in Oregon and Washington, sparked by teaching dates in Bend and Sunriver, Oregon. I decided to make it a road trip on either end, visiting friends I haven’t seen in a long time and combining the visits with my dates with the quilt guilds. Here’s a few pictures and memories of my 1,600 miles driven in 12 days! 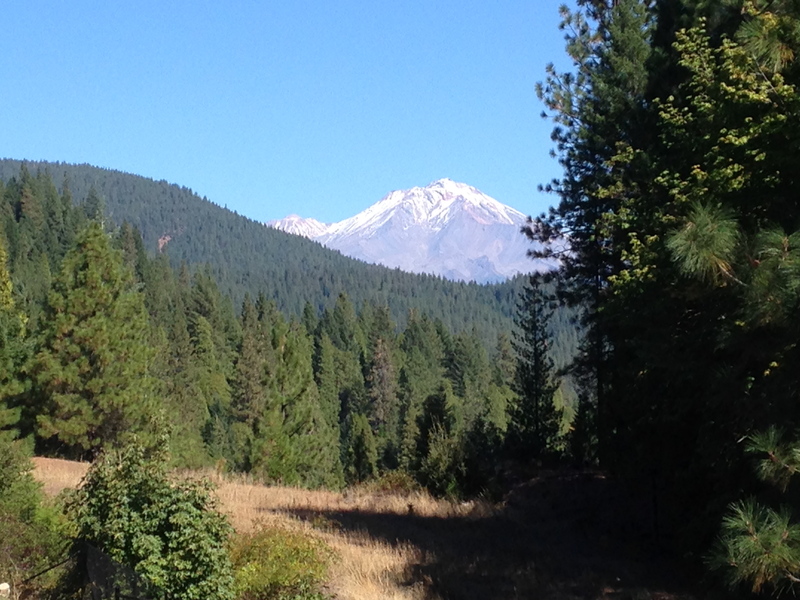 My first peek at a snow-covered mountain, which I had to pull over and take a picture of….Mount Lassen. 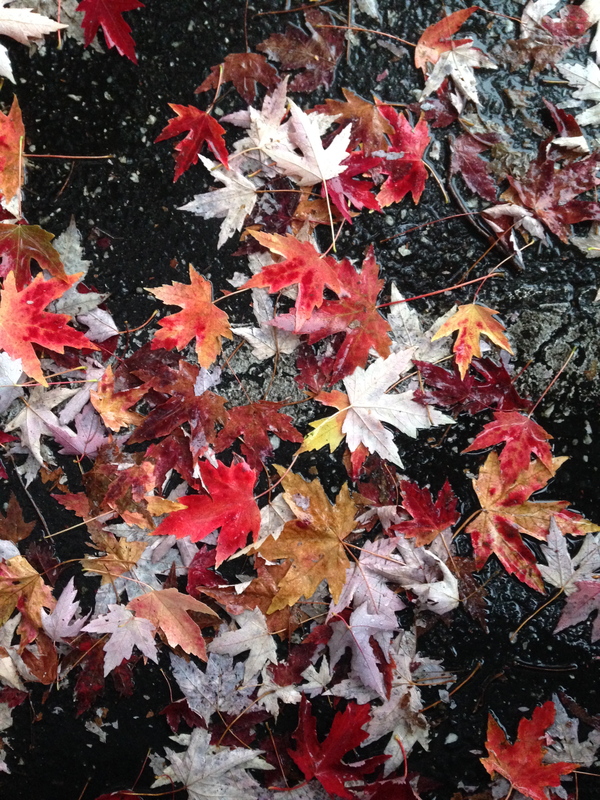 After many months of heat and dry weather here in Grass Valley it was such a pleasure to see this. 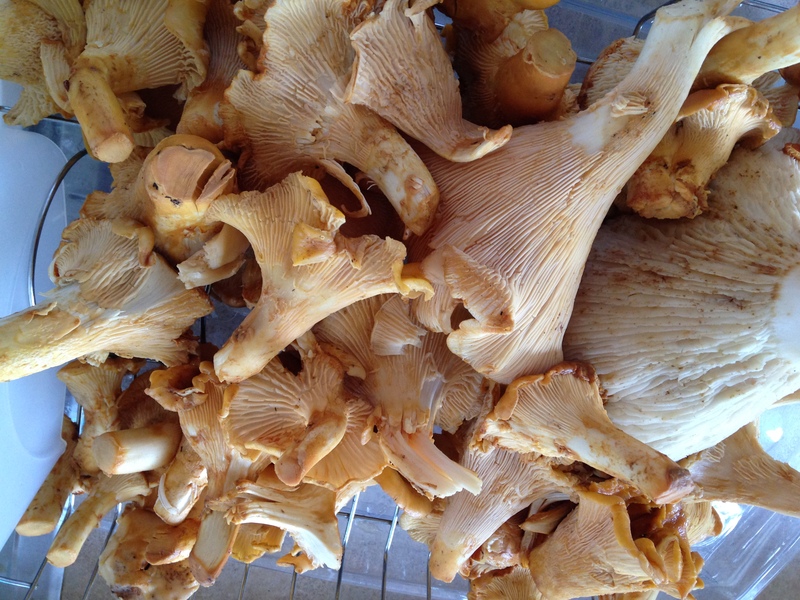 A sure sign of Fall! My first stop was Portland, a long drive from Grass Valley (I was so glad to have books on CD to listen to on those long stretches). Portland is such a fun town, so much to look at, and so may cute shops and stores. And…the best salted caramel-ribbon ice cream I ever tasted! Wouldn’t this make an interesting modern quilt design? Love the colors. On to northern Washington, where I visited a friend in Auburn, outside Seattle. 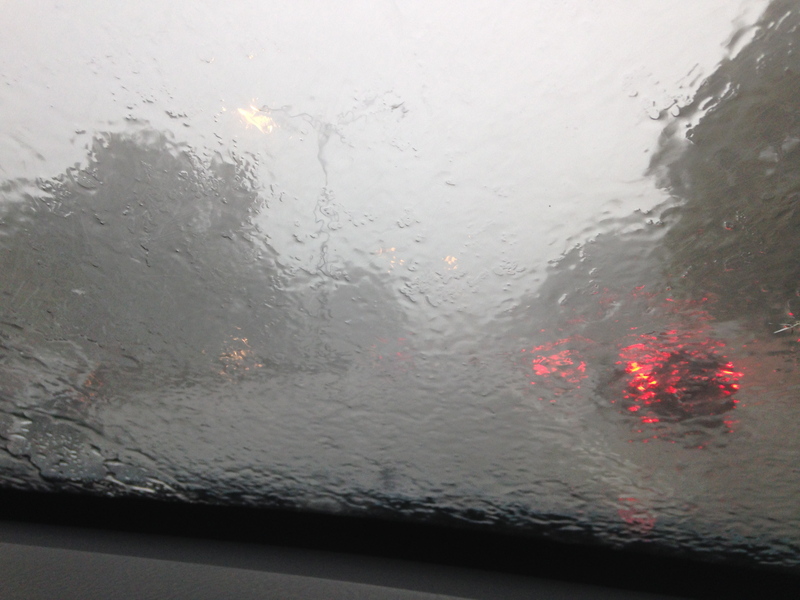 We had wild weather (had to almost stop on the freeway for the rain) and went to as many quilt shops as we could! 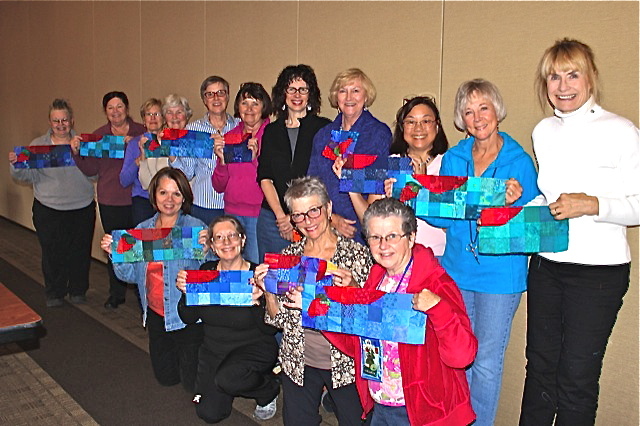 Onward (and south again) to Bend, Oregon where I did my lecture and class for the Mount Bachelor Quilt Guild. The terrain definitely changed! What a great group of ladies I had in my class, they could not have been more of a pleasure! 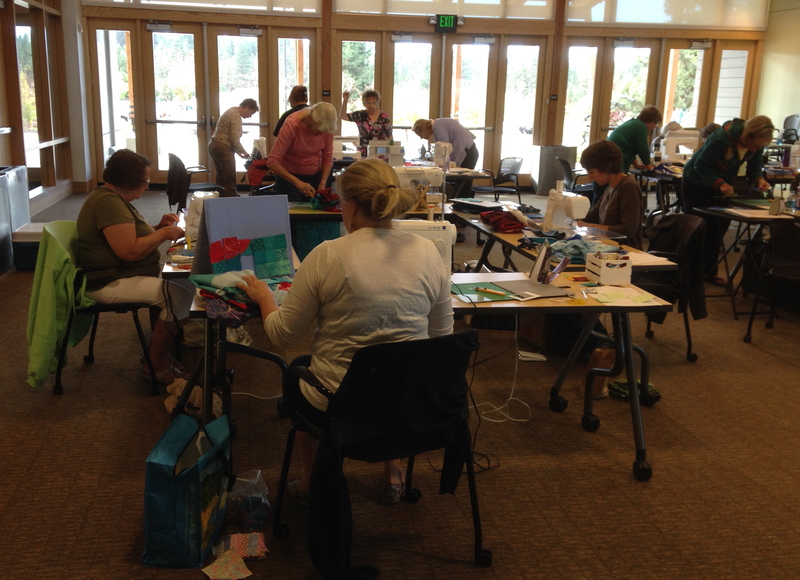 Bend has beautiful facilities, and the workshop was held in one of the nicest I’ve had the pleasure of teaching in. 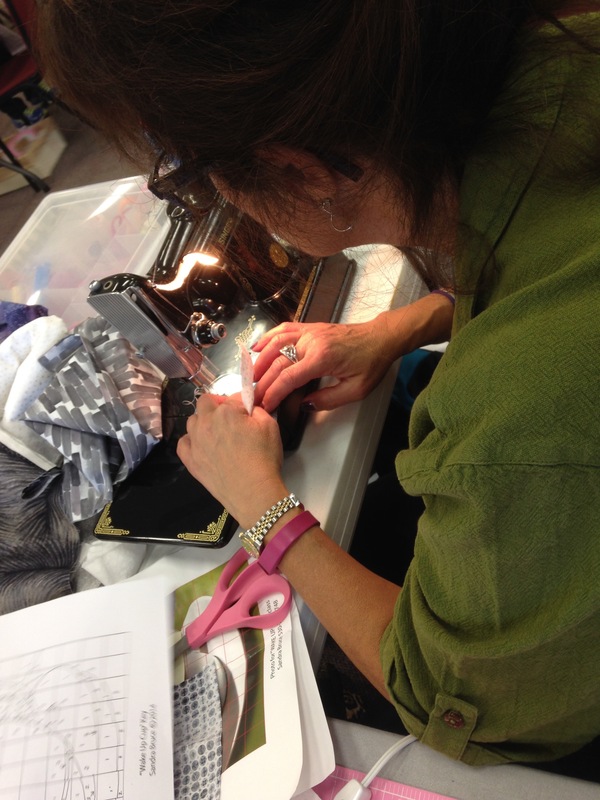 Here’s a couple of shots from the Bend workshop and guild meeting that night. 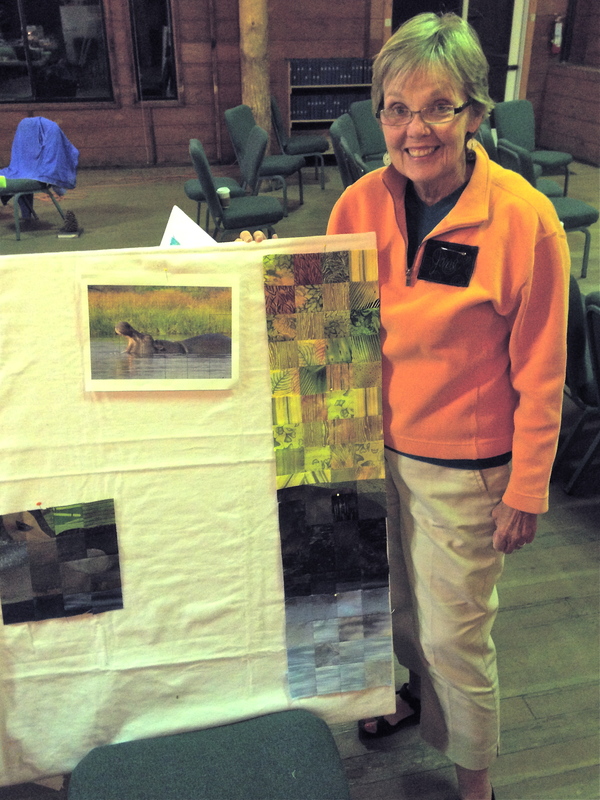 My stay in Bend was over too soon…..the next morning I drove to Sunriver to do my lecture for the Mountain Meadow Quilters’ 9:30am meeting. Again, a beautiful setting. I so enjoy being in guild meetings, to see the workings of other guilds and especially Show and Tell! 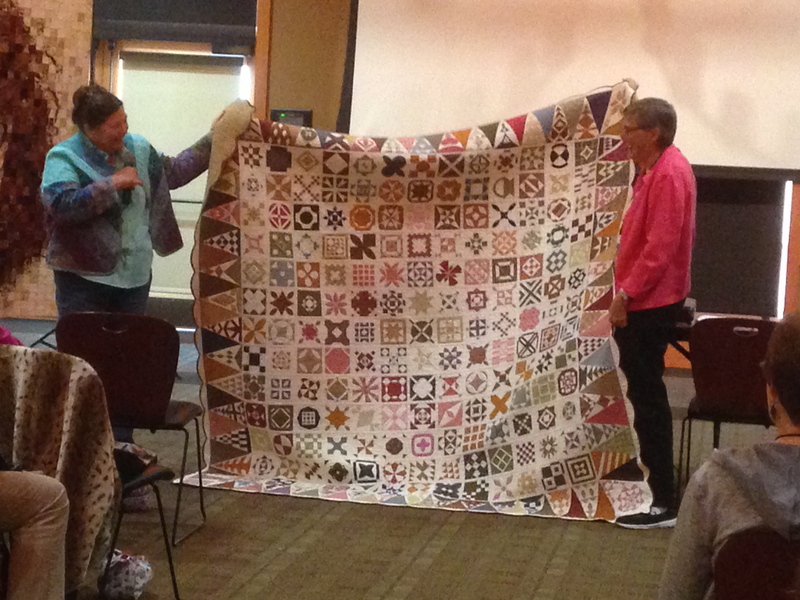 One day I want to make a “Dear Jane” quilt like this one, wow!! 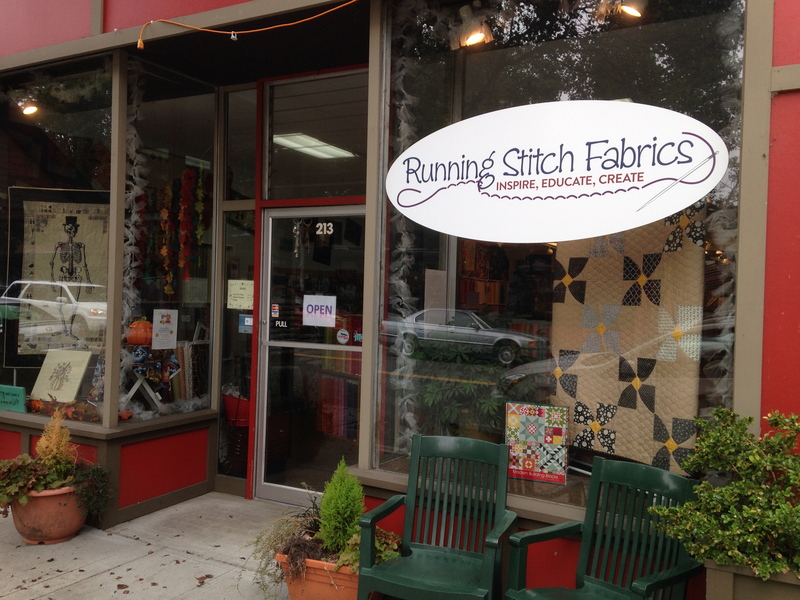 My afternoon was free, which of course means going to quilt shops in the area, and there are many! 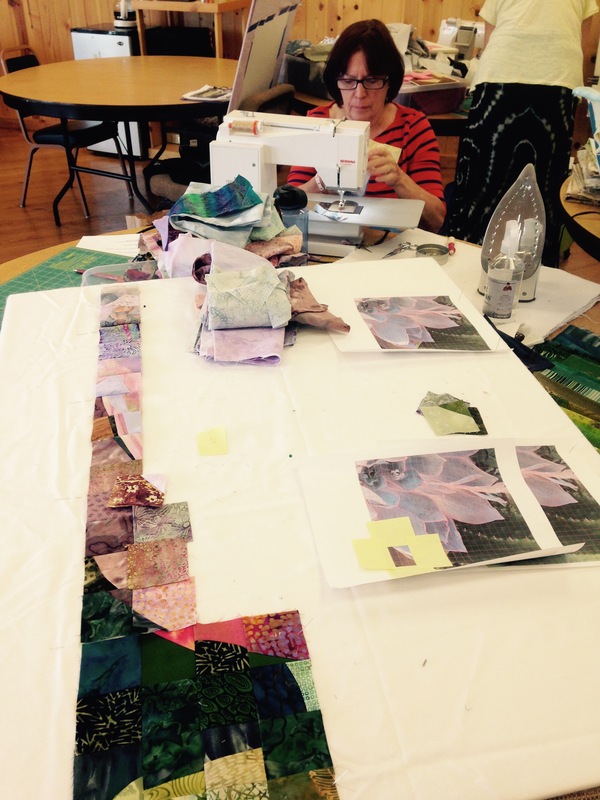 It is amazing how many quilters and quilt shops there are in the Sisters/Bend/Sunriver area. 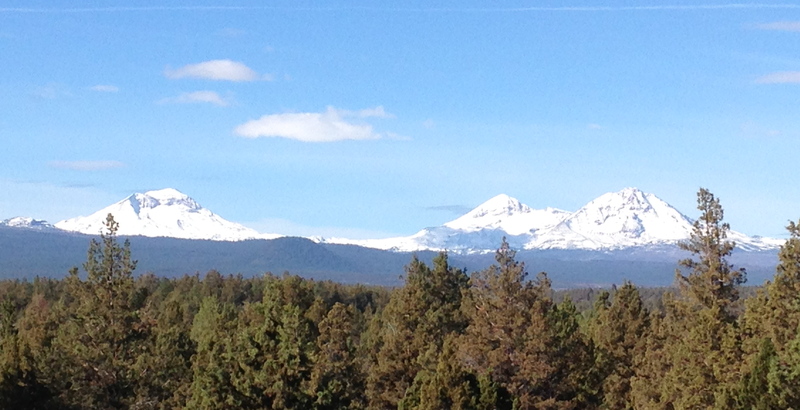 Next day, the Sunriver workshop. Again, a nicer or more enthusiastic group of ladies could not be found. I left Sunriver to head back to Portland to visit more friends before coming home. I stopped to take a picture of Mount Bachelor and the “Three Sisters”, which had had it’s first dusting of snow days before. Beautiful! 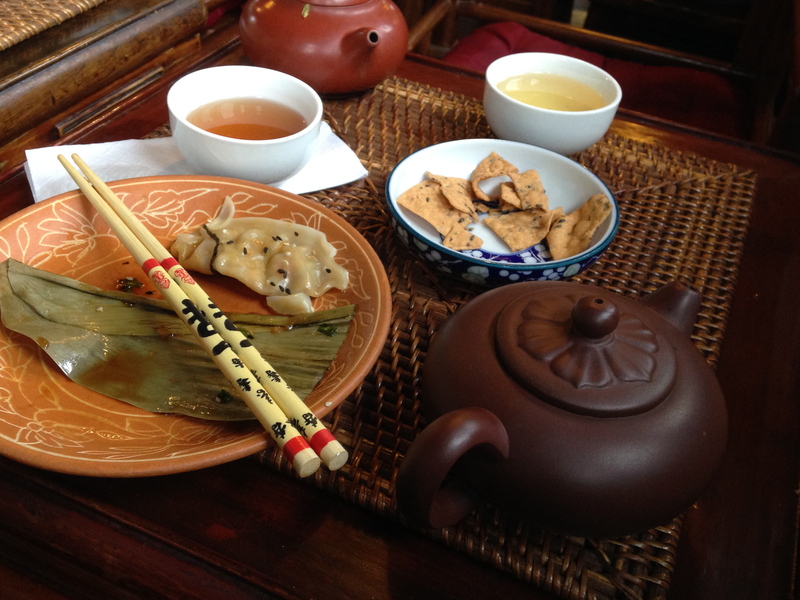 Back in Portland, I visited the Chinese Gardens for tea, and had a few fabulous meals, including one made with freshly picked chanterelles (picked by my hostess that morning). The best part was reconnecting with friends (and kitties). All in all, a wonderful trip, in which I became rejuvenated by students, quilts, quilt stores, friends, scenery, and the delicious opportunity to be alone in my car for all those miles. Thanks to all the Bend and Sunriver ladies who welcomed and pampered me, and my friends whom I care about and was so happy to see, and took such good care of me. Back in Grass Valley, we had a rainy Halloween yesterday, cold and windy too, but we cannot complain about one drop of that precipitation! I am back to my long arm work, and am also working on a greeting card design in my lettering business. Fremont, CA this week, and Modesto, CA next week for Matrix lecture/workshops. 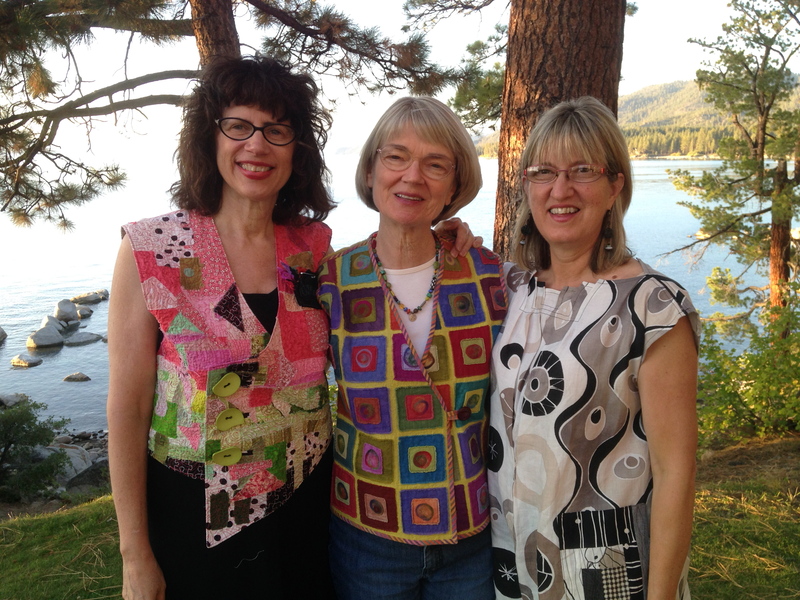 Christine, Heidi and I are still working on the Zephyr dates for 2015, stay tuned. The holidays are around the corner! 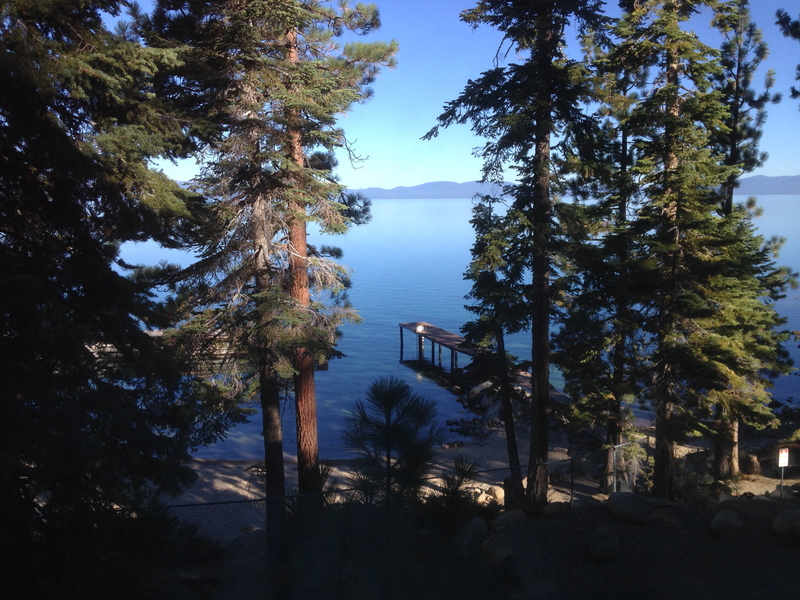 It’s official: The first ever Artistic Alchemy retreat is history! The three of us had a great time, and judging from our students’ comments, so did all of you who came. 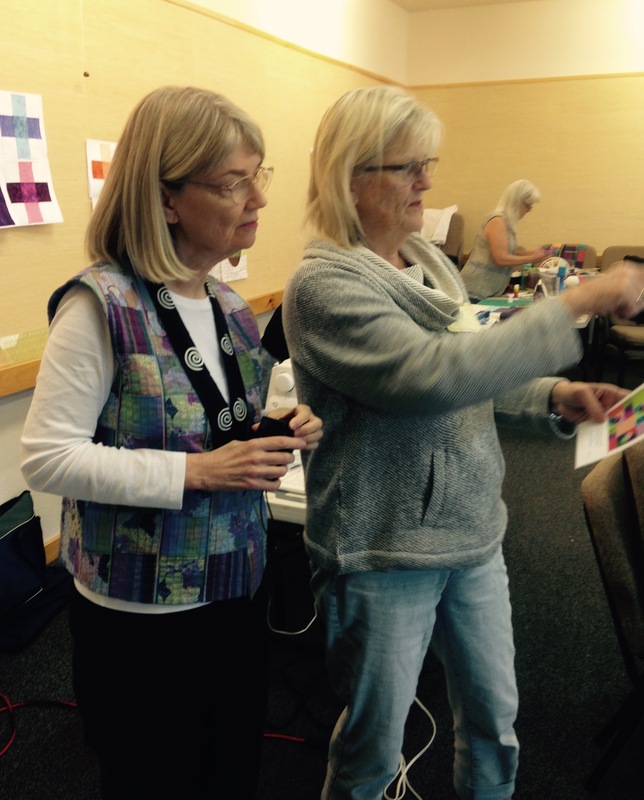 The creativity quotient was high, the laughter was contagious, and the projects—wow! 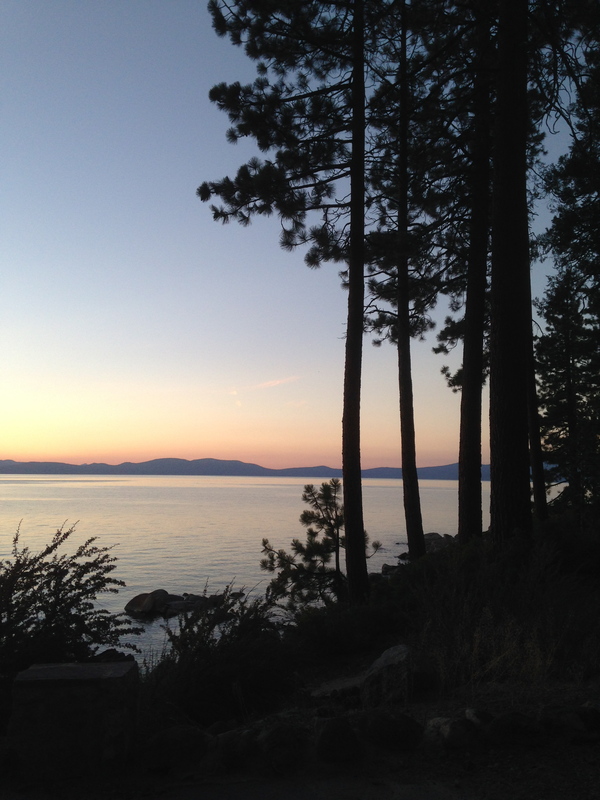 Below are some class images, lunchtime show-and-tell pics, and shots of Lake Tahoe and the Zephyr grounds. Watch for details about next year’s retreat. Heidi is working with Zephyr on the dates, and we are hopeful we can add an extra day, for a total of three full days in class. This could be YOU, next year! Stay tuned. . . .